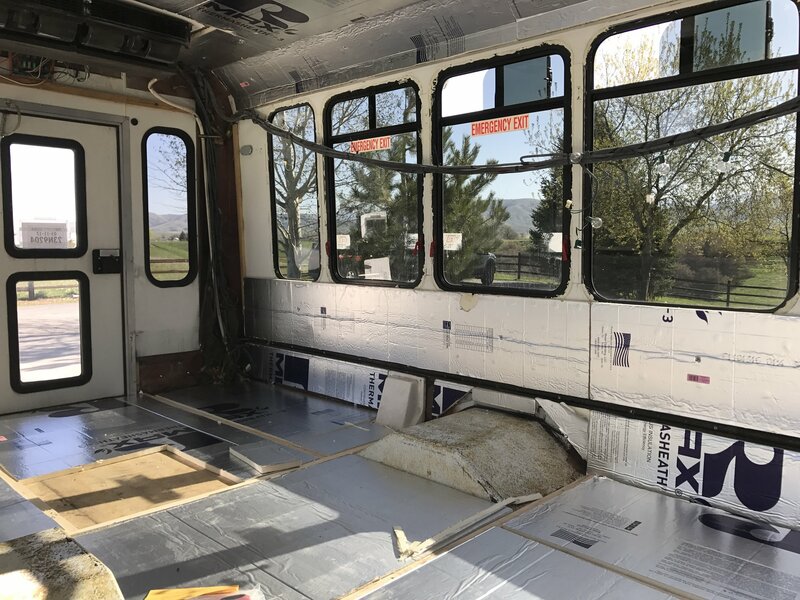 Our best resources in this process were skoolie.net, where there are excellent advice forums and lots of contributors with conversion experience, and THIS Sprinter conversion sourcebook. 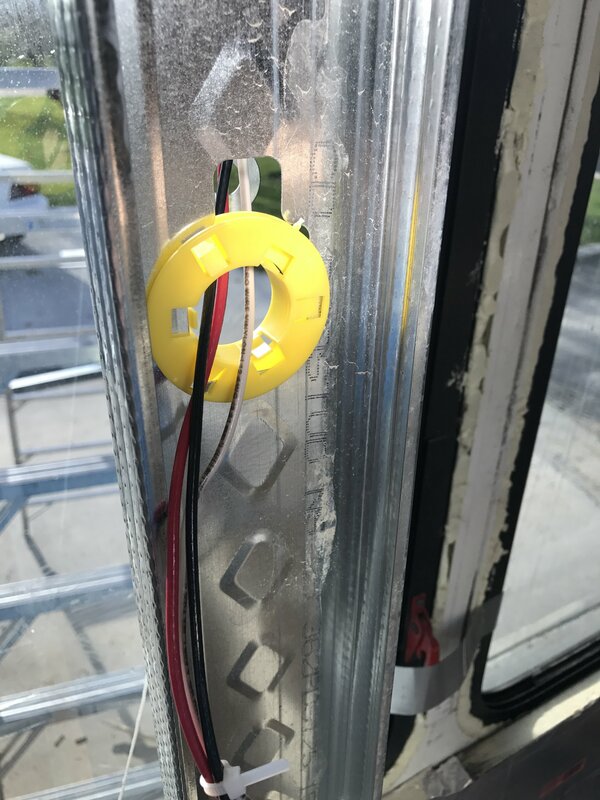 Google and YouTube consistently came in clutch when we had very specific questions, especially about wiring and plumbing, and there were a few Instagram accounts we found of people who were converting shuttle buses like ours, which was helpful. 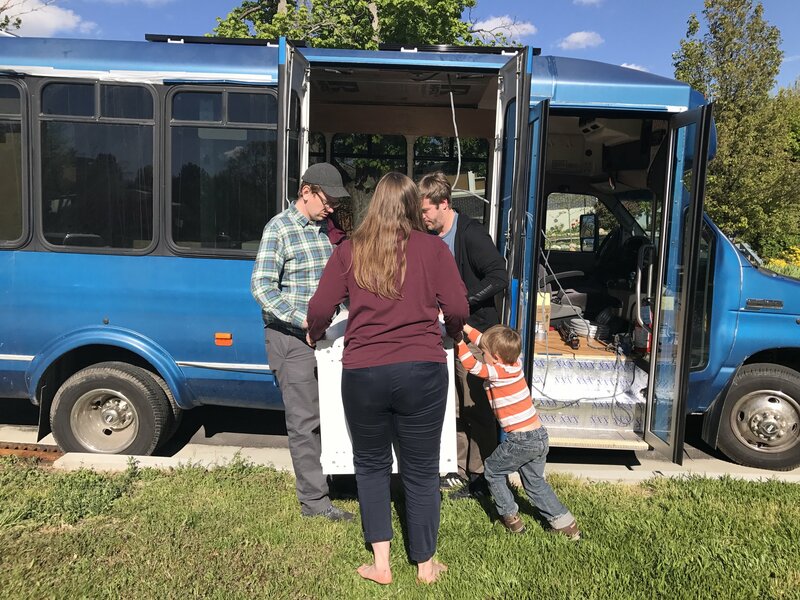 There are many more resources for converting vans and school buses than there are for buses like ours. 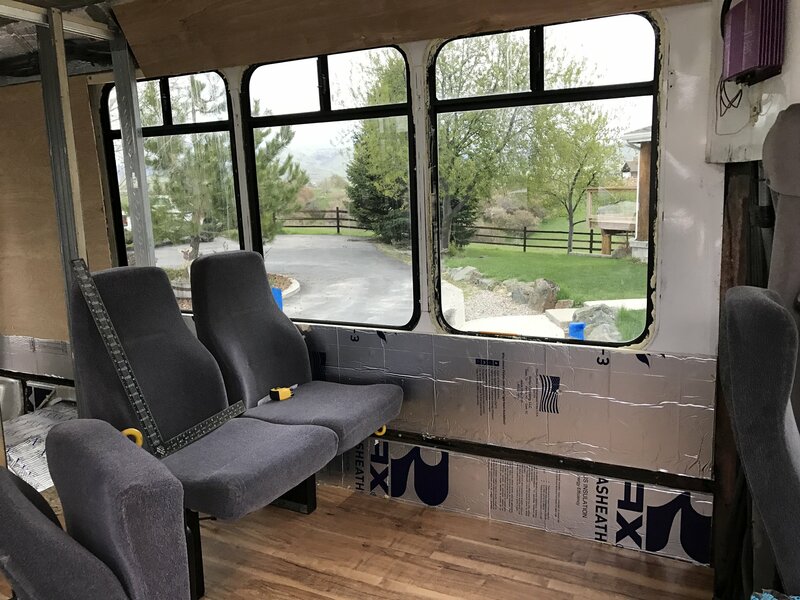 A lot of the information transferred to what we were doing, but certain processes, like attaching insulation and paneling to our bus frame, were very different. 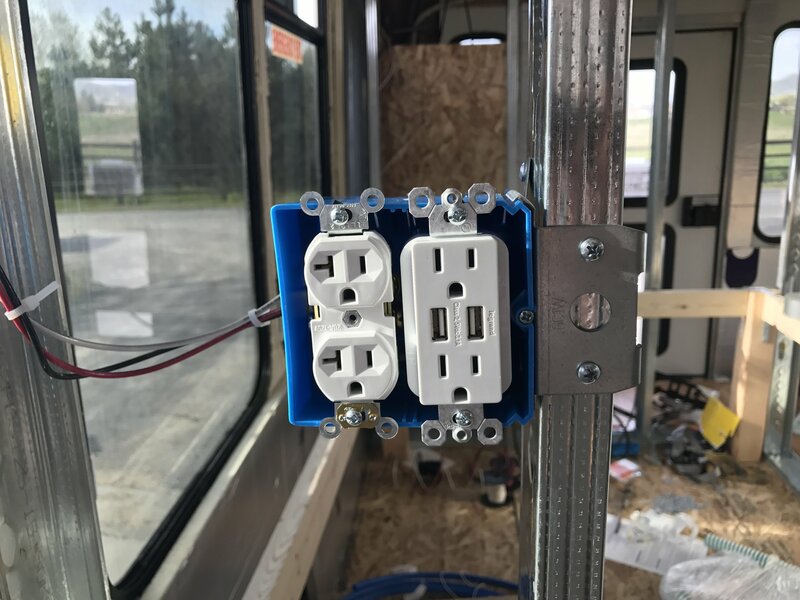 So most of what we did will apply to anyone converting a vehicle, but we especially hope this post can find some fellow shuttle bus converter and be of use! 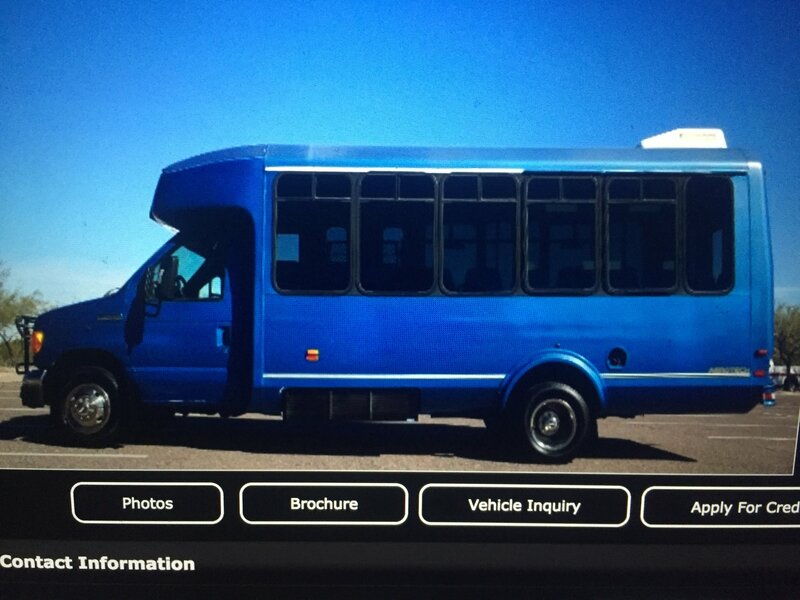 In the process of Googling buses for sale, we found a dealer in Scottsdale, AZ (website HERE) who buys used vehicles at auction, cleans them up and re-sells them. David’s parents spend a lot of time in Scottsdale, and they happened to be there at the time, so they went to his shop and sent us lots of pictures and videos of a few shuttle buses. 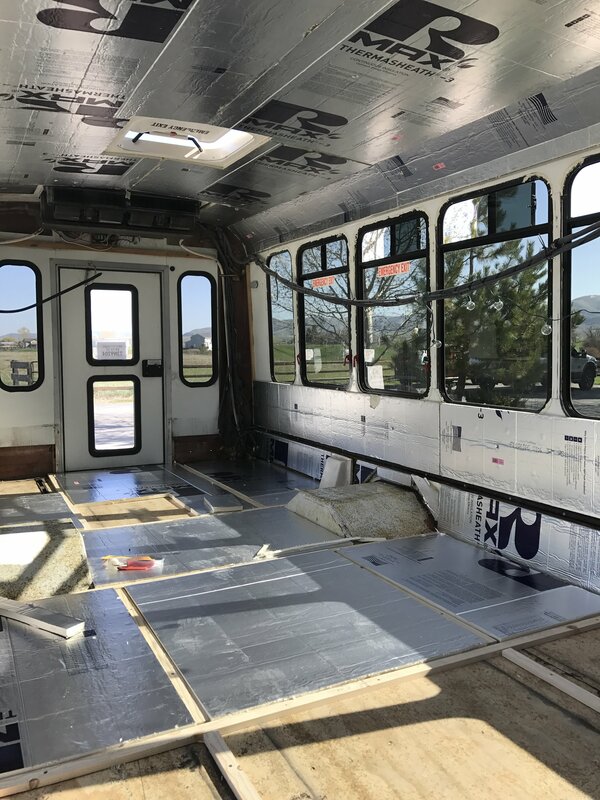 We decided to move forward on a 2007 Eldorado Aerotech built on a Ford E450 chassis. It had 143,000 miles, a V-10 engine and, since it had spent its life as a city bus in Tempe, AZ, no rust. 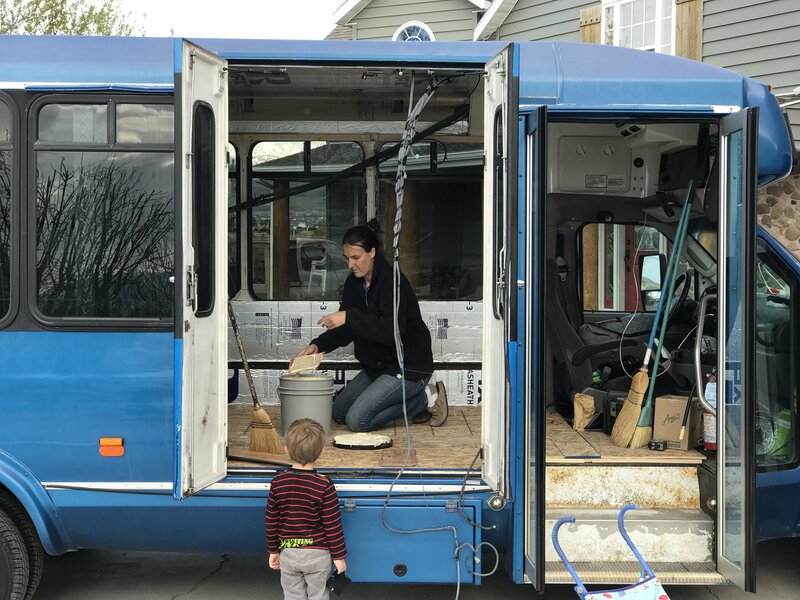 We purchased the bus, and David flew out a few weeks later to drive it up to live with family in Utah. 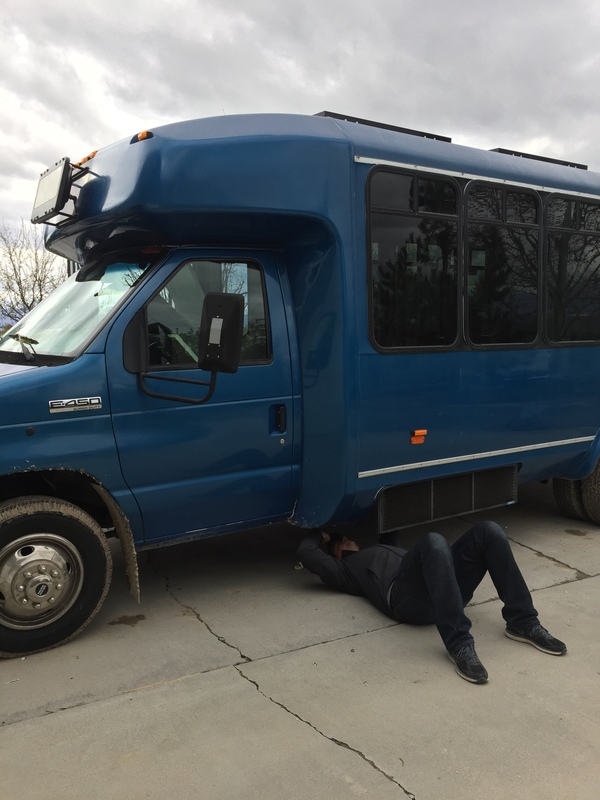 On the drive from Phoenix to Salt Lake City, David had a lot of trouble with the tires. We knew they were old; we learned they were actually dry-rotted and cracked from living in the desert sun. 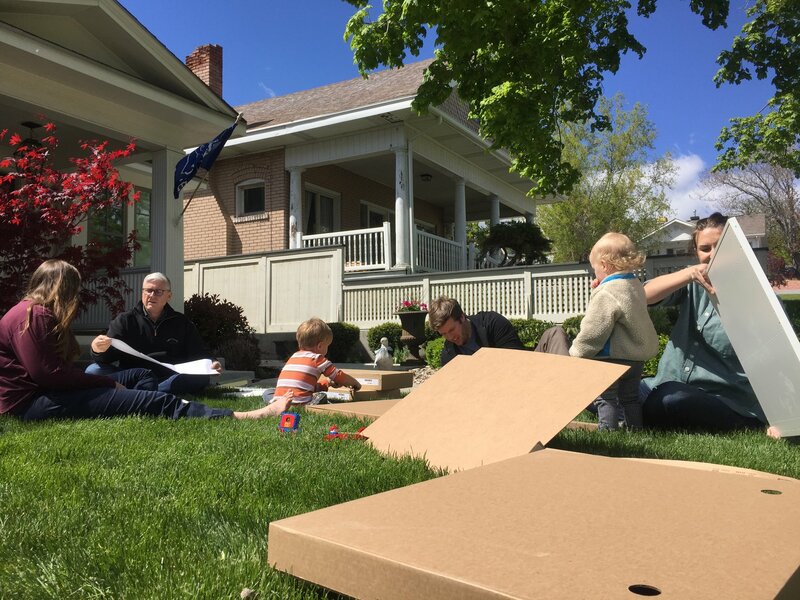 We replaced all six tires in Salt Lake. This was our first view of buster. It was love at first click. The bus only had one previous owner (the city of Tempe, AZ) and spent it’s entire life in a flat, desert environment. This meant that it was well maintained and had no rust or body problems that needed fixing. With the timeline we were trying to stick to we didn’t have the time to spend grinding out rust and fixing structural problems. The bus is big, but not too big. It’s 25’ long without the bike rack and is tall enough for us to stand up in (a little more than 6’3” inside). It also had a back door which was important for our plans to make an office in the back. 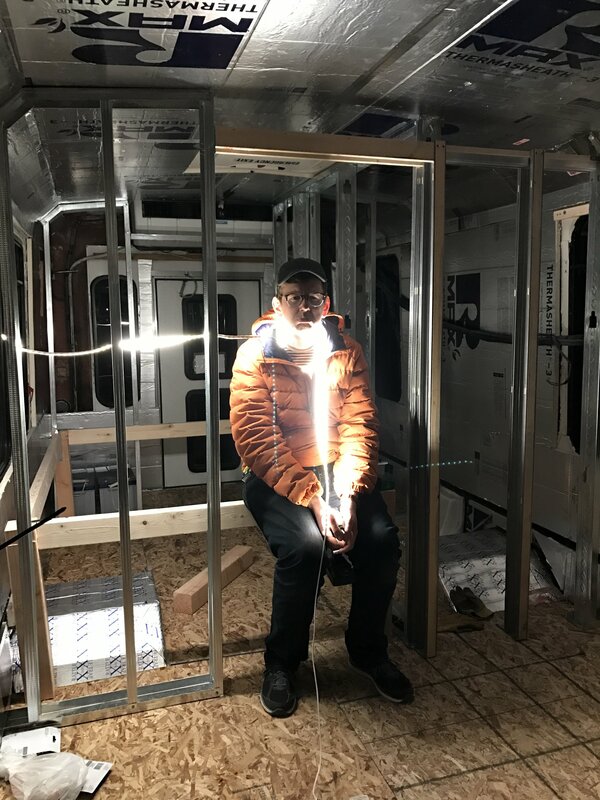 If this whole endeavor was going to work out, I (David) needed to be able to work on the road and in order to do that I needed a dedicated space that I could close off. 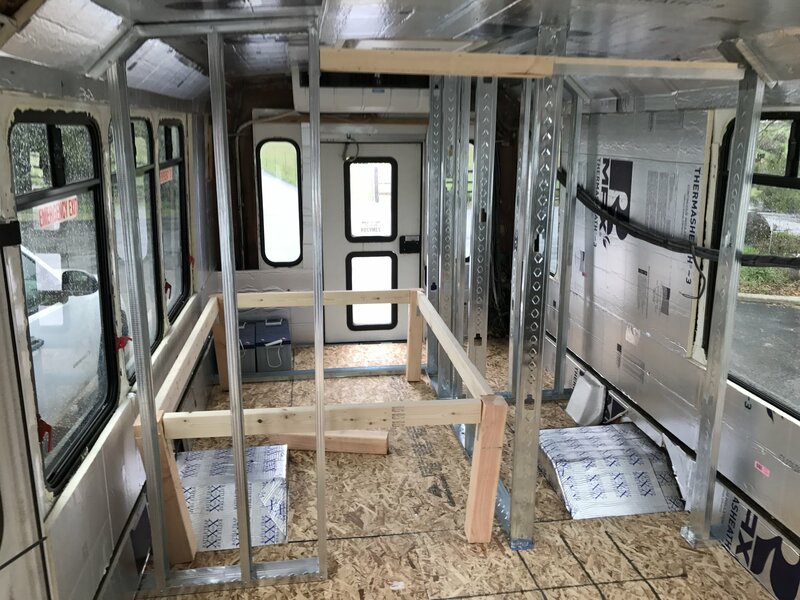 The interior space is 7.5′ wide and about 16′ long depending on how you measure it. It’s tall enough for me (6’2″) to stand in. The is a picture of me driving off into the sunset after picking up the bus. I giggled like a little kid for about half an hour. 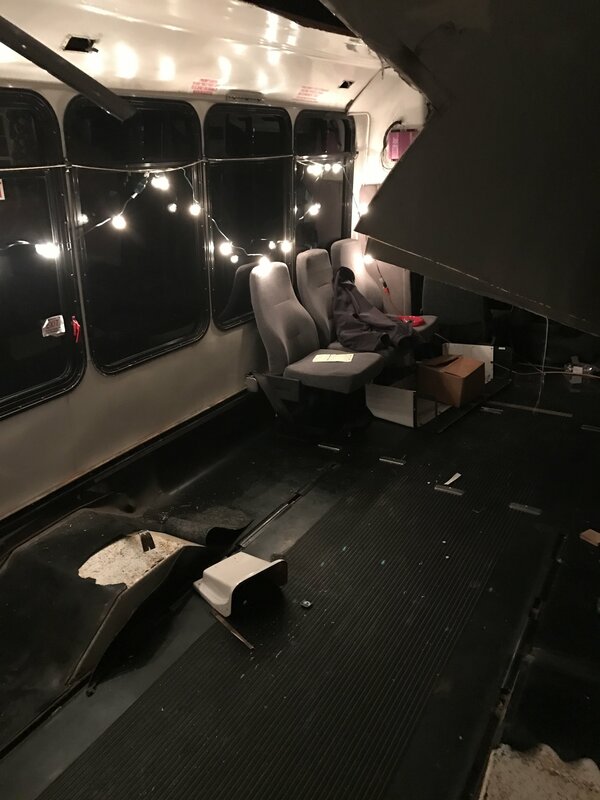 While the bus was living with David’s sister and her husband, they helped us out by removing all but three of the seats. 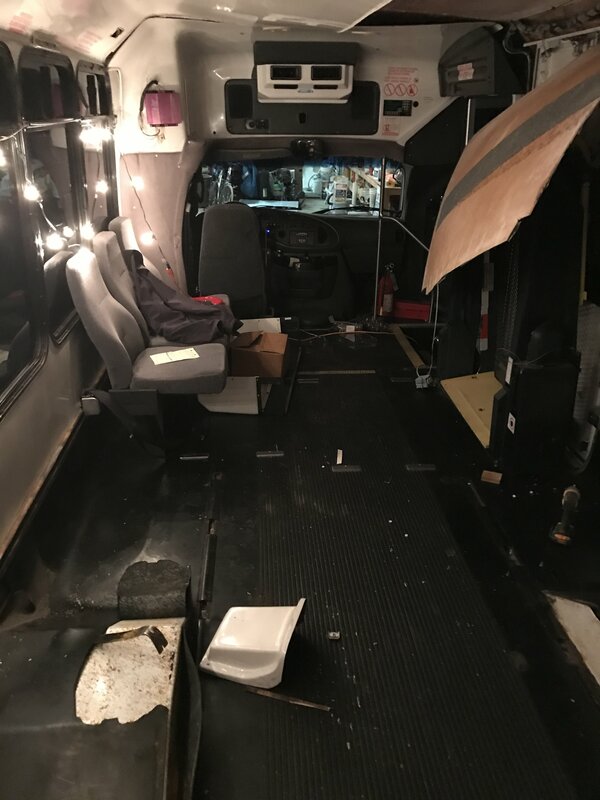 Most of the seats in the bus were attached to a steel track on the wall; the three they left in were bolted through the floor. These guys also took out poles for us, which was nice of them, but ruined any hope of turning the bus into a stripper club at night. 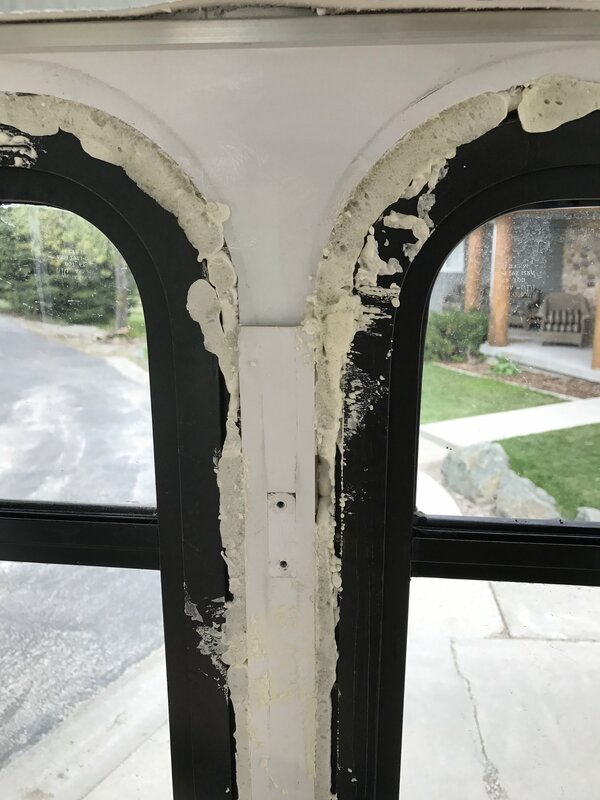 We got on the scene in mid-April and took the bus up to my parents’ house in Idaho, where we finished taking out seats and ripped out the fiberglass paneling on the interior of the bus. This involved disassembling many odds and ends, like molding, and where we couldn’t remove paneling (like around the ceiling A/C unit) we used a grinder to cut off as much as possible. 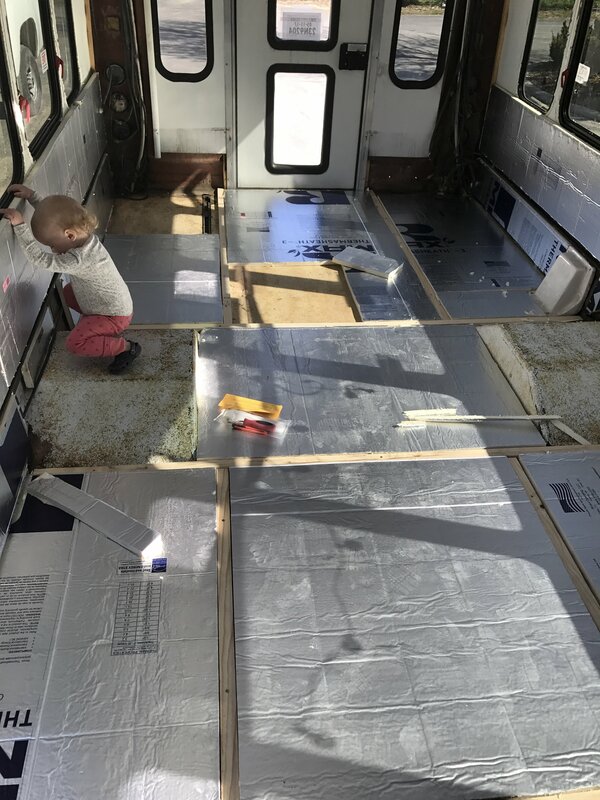 The rubber flooring pulled up pretty easily in most places, though we had to get a crowbar involved in spots; underneath was a plywood subfloor. Demolition moved fairly quickly; the only part that was a real pain was removing the handicapped lift. 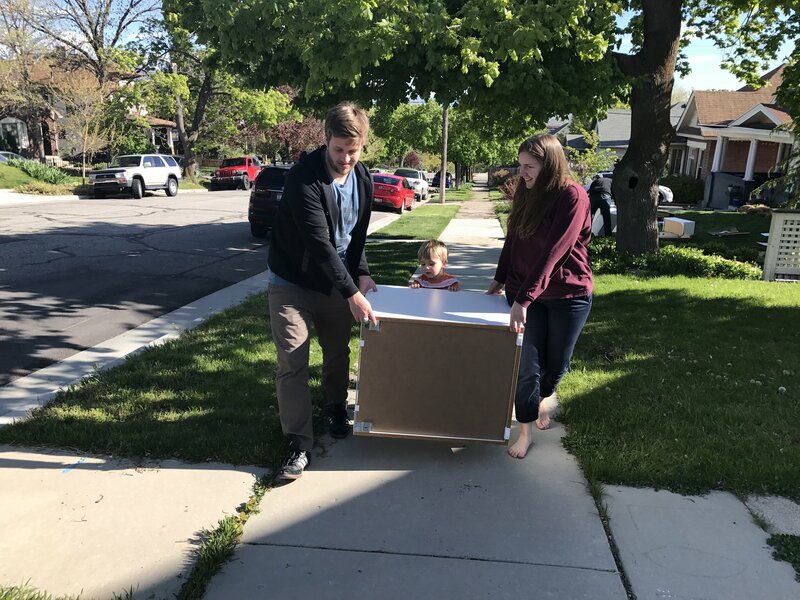 That thing was insanely heavy; you can sell them, but we were anxious to get it off our hands and ended up finding a cool guy who works in accessible transportation for a city near ours to give it to. He and David unscrewed it all and shoved it out the lift doors, almost taking David’s leg off in the process. 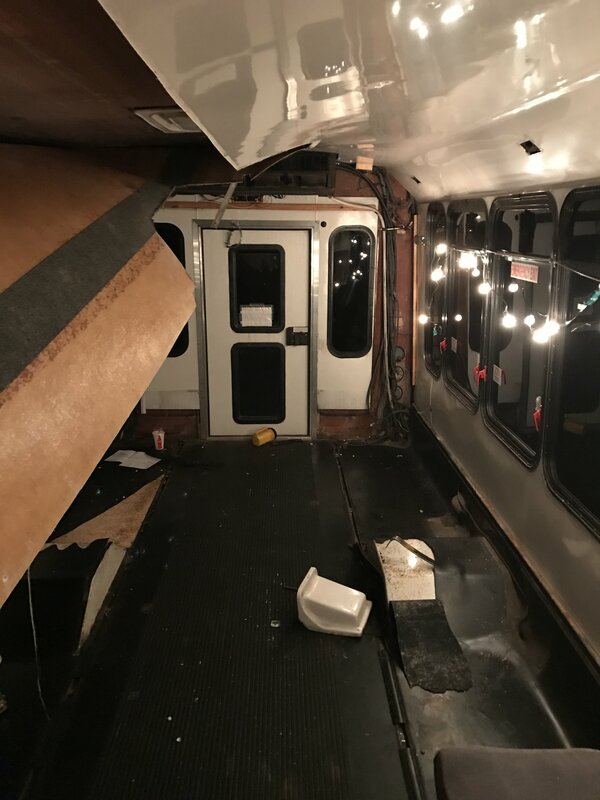 With the lift gone, that side of the bus rode much higher, since the suspension was adjusted for a heavier load. Once we filled that side of the bus with our kitchen, water tank, propane tank and battery bank, the bus rode much more evenly. All the scraps of trim and flooring that we removed. Those are the seats that we would eventually reinstall around our table. The fiberglass panelling on the ceiling is all one huge piece so it had to be taken off all at once. The poles were holding most of it up but the section in the back was held up by the rear air conditioning unit. 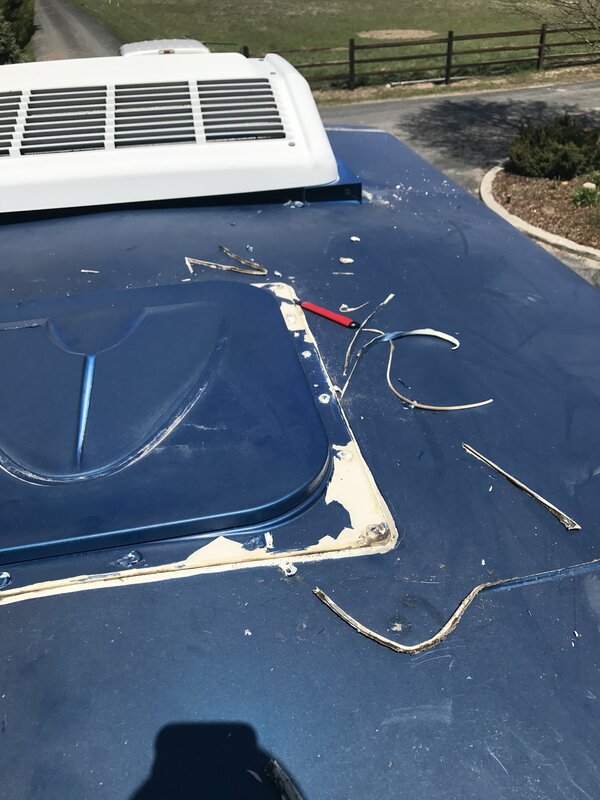 Since I wasn’t too keen to remove the A/C we used a grinder to trim off the excess fiberglass. WEAR LOTS OF PROTECTION if you find yourself in a similar situation. 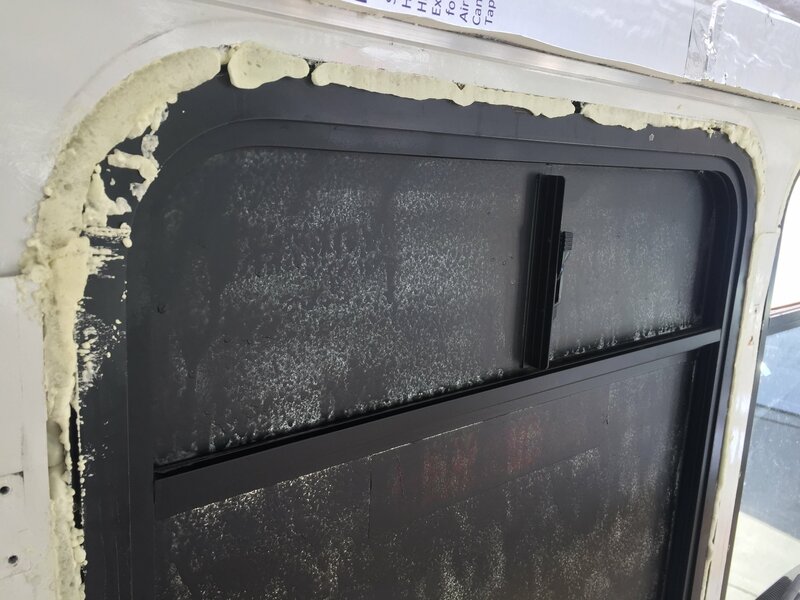 Fiberglass dust is nothing to mess around with. Here’s a peek at what the bus is actually made of . The shell is a fiberglass “sandwich” supported by a steel frame. 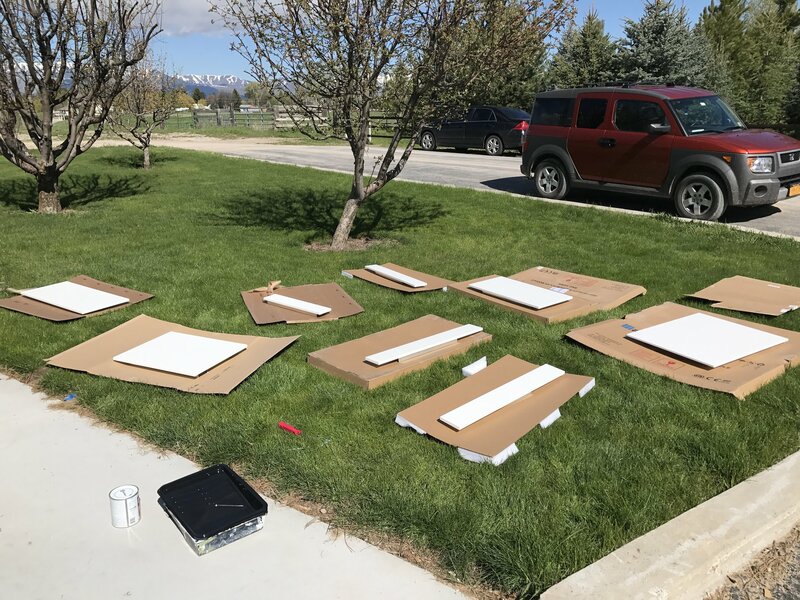 It consists of an outer layer of fiberglass followed by a honeycomb type material that seems to be made of something like corrugated cardboard. 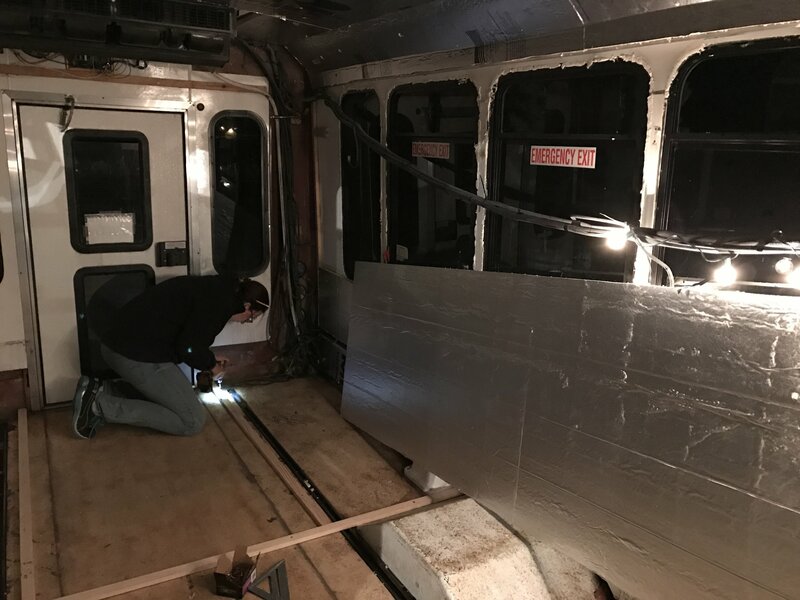 There is then another layer of fiberglass on the inside and square steel tubing running between the windows for the frame. The upshot of all of this is that we could drill things directly into the wall if we had the right sized screws (not too long!). 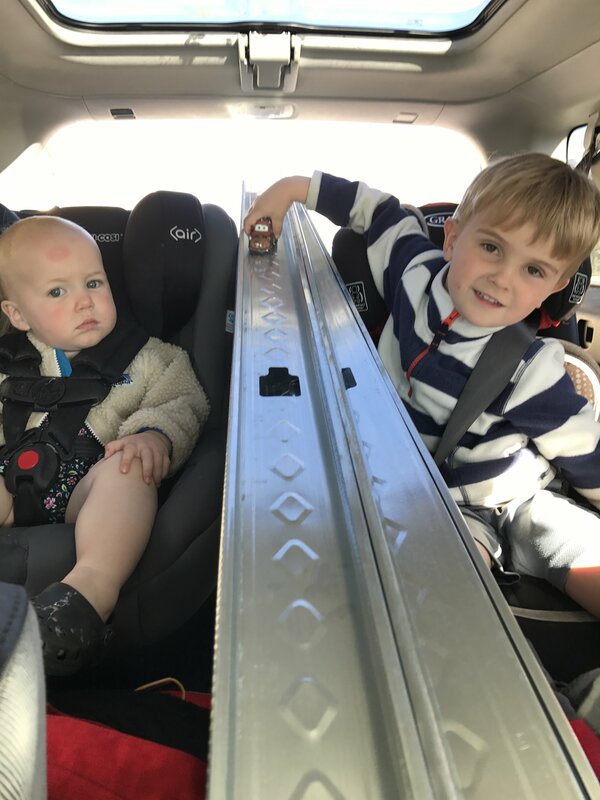 This saved us having to build a frame of 2×4’s to secure things to which saved us precious space! We found self tapping screws to work the best. They held strong once they were in but if you went in too fast or too hard they would strip out the holes. I always went with a lower drill torque setting and tried not to go too fast. 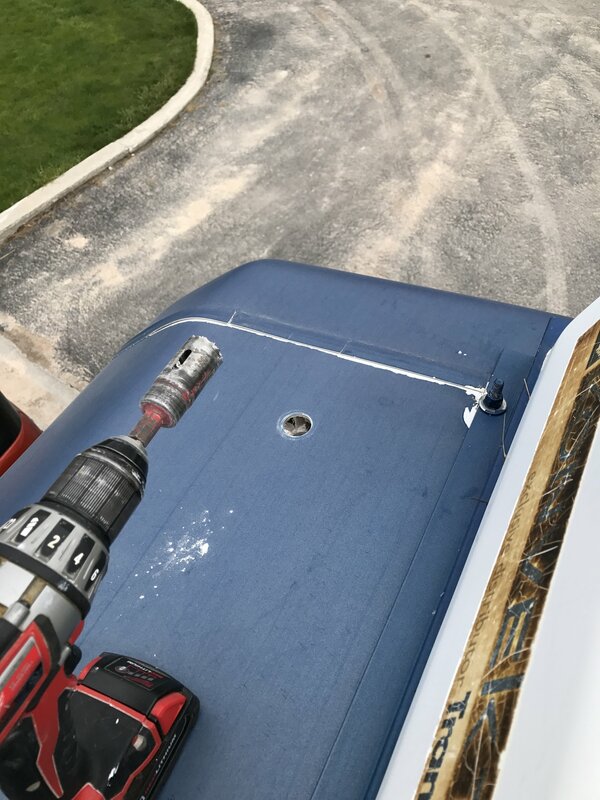 Drilling into the metal frame was easy and very solid but we did need to drill pilot holes for the screws first, self tapping screws wouldn’t go through the thick steel tubing. We left most of our windows clear, but in a few places we wanted to cover them up. We sprayed these windows with several coats of Plasti Dip, then covered them with reflectix and foam board. Where there were gaps in the frame around the remaining windows, we filled them with Great Stuff spray foam. 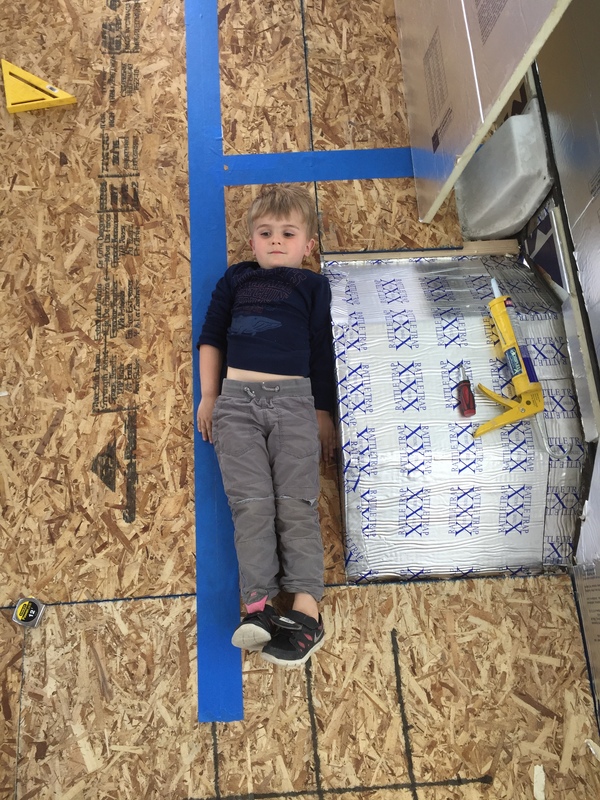 After insulating the floor, we installed a plywood subfloor of 1/2-inch OSB. 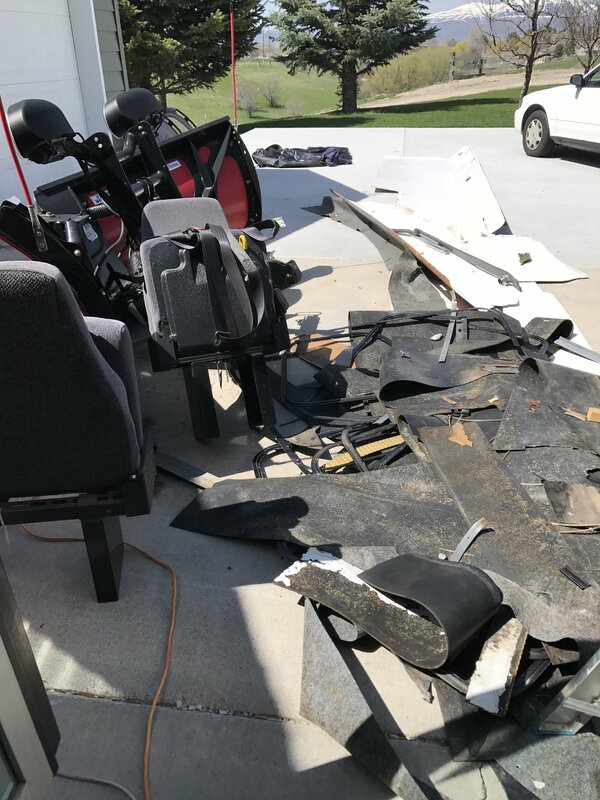 We also covered the wheel wells and stairs with FatMat rattletrap. All of the wires you see hanging down are for the rear lights and air conditioner. We left as much of the original electrical system in place as we could . 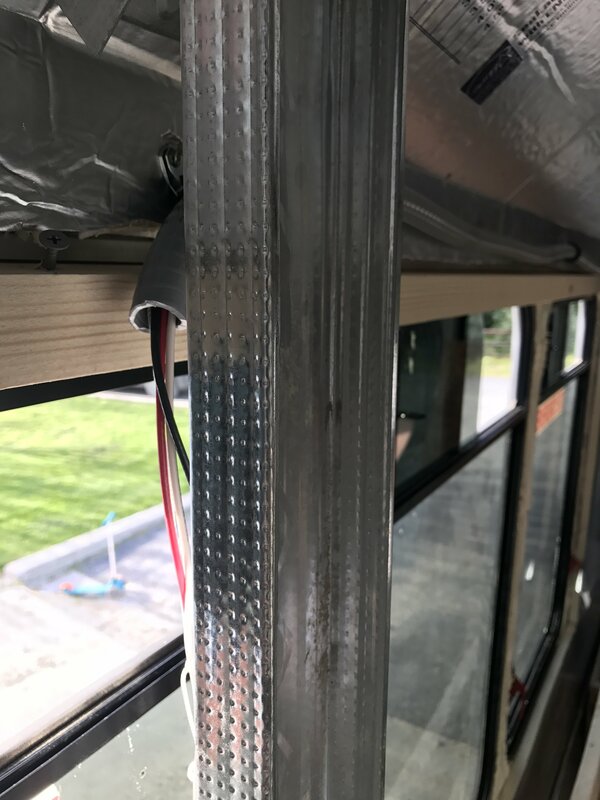 Originally I imagined that we would wire our electrical system into the bus’ original system and use it’s power distribution board and fuse box. 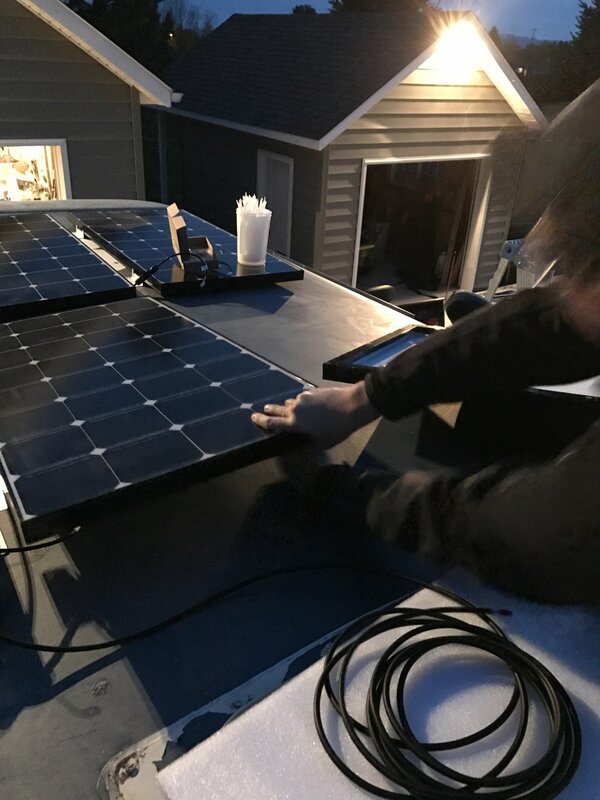 As I got deeper into it I realized it was way above my ability so we ended up keeping our electrical work simple and self contained. THe bus system is still intact behind the walls if we ever want to change anything or access it. We had some rattle trap left, so we just stuck it around randomly. 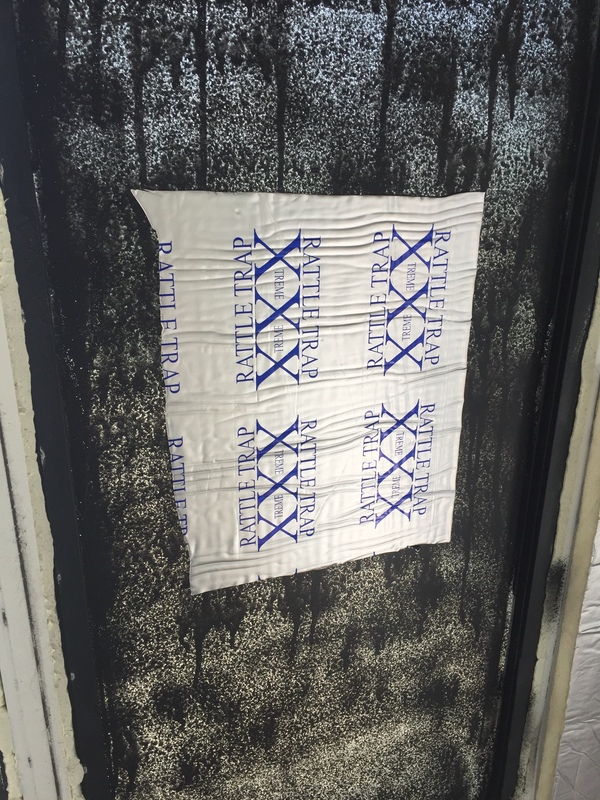 We used super 77 spray adhesive to attach the reflectix to the windows. 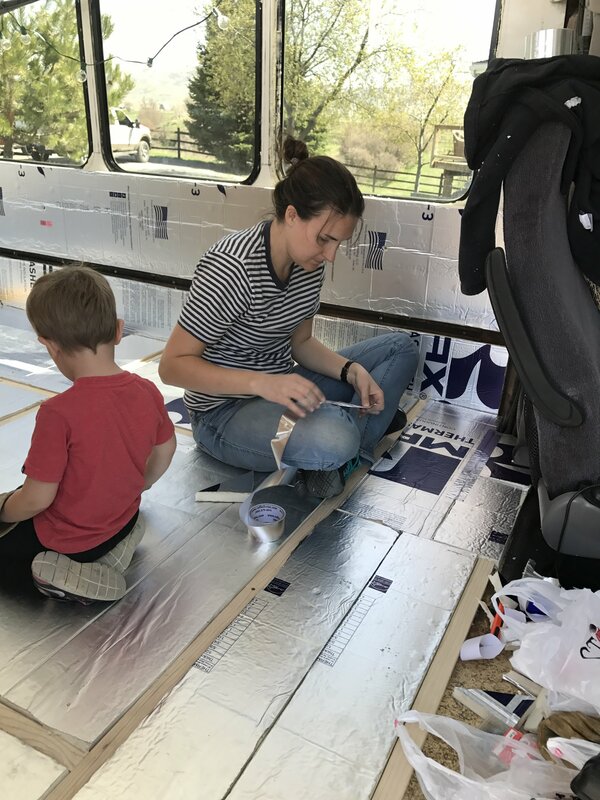 One of our goals for the bus was to section the space out to make it functional for several needs at a time: working, sleeping, cooking, etc. 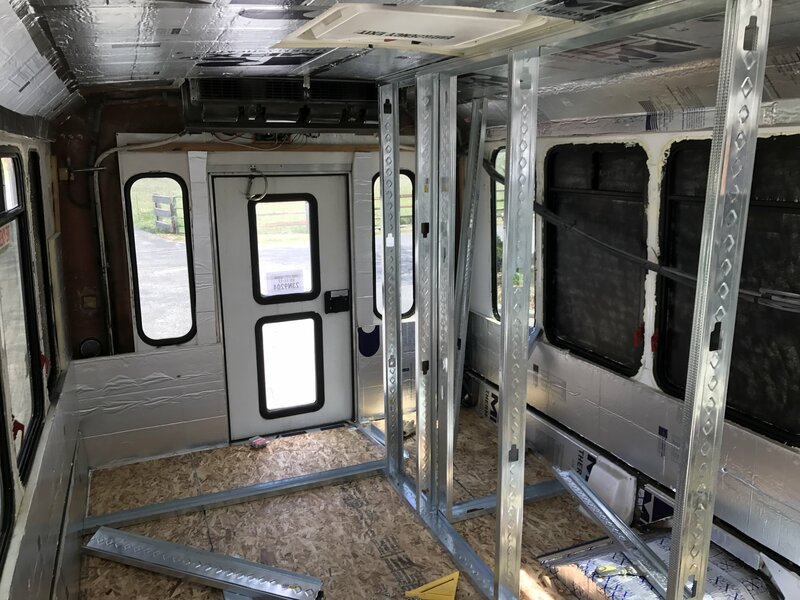 We decided to wall it off into three spaces: a kitchen and seating space in the front, a bedroom in the middle, and an office and garage space in the back. 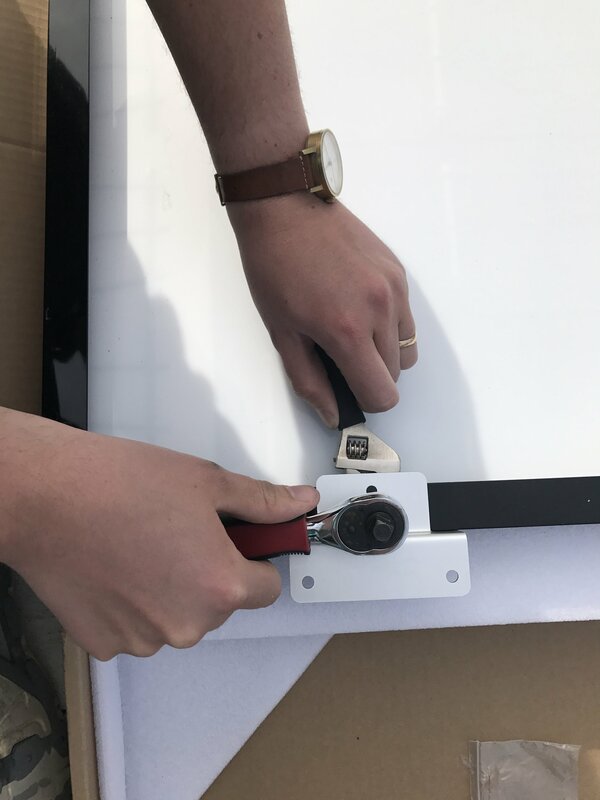 We used metal studs for framing because they’re light, flexible and easy to work with (you can cut them with tin snips). 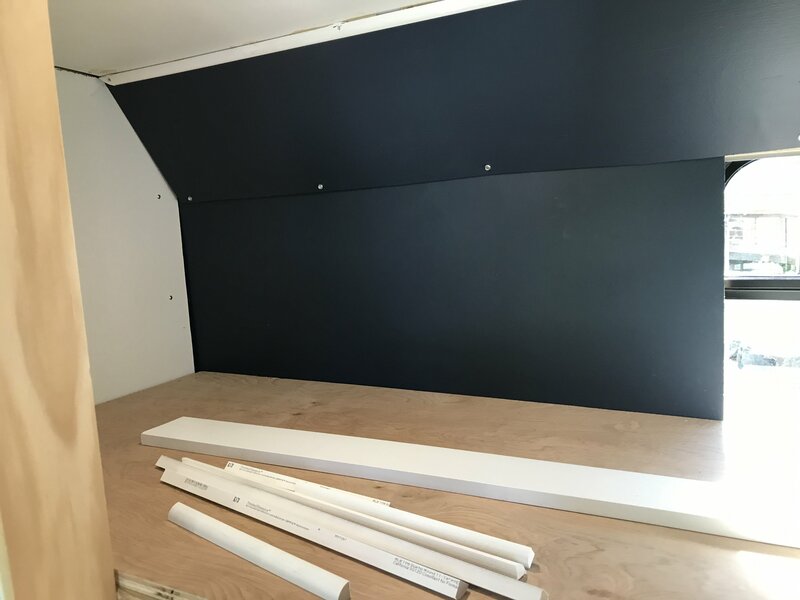 We spent a lot of time measuring the space and mapping the walls out with tape on the floor before we installed anything. 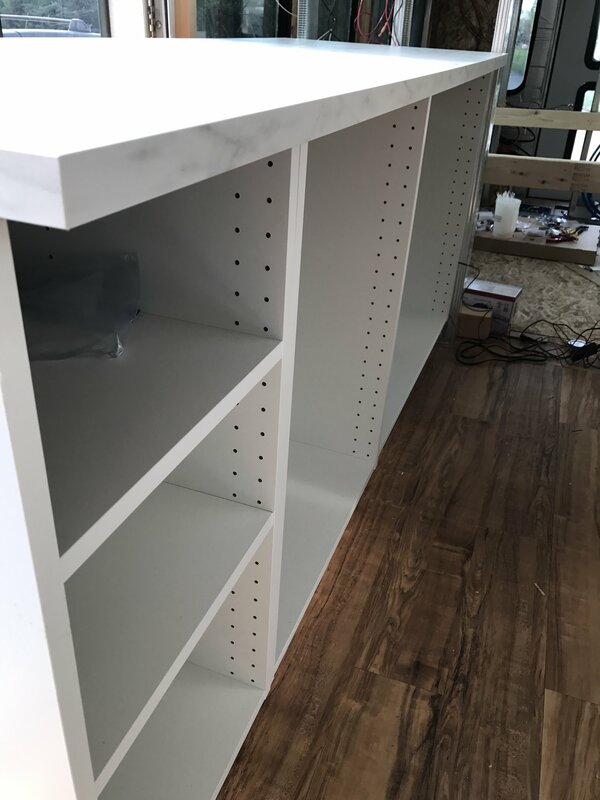 After running metal tracks along the floor and ceiling, it was just a matter of cutting studs to fit and screwing things together. 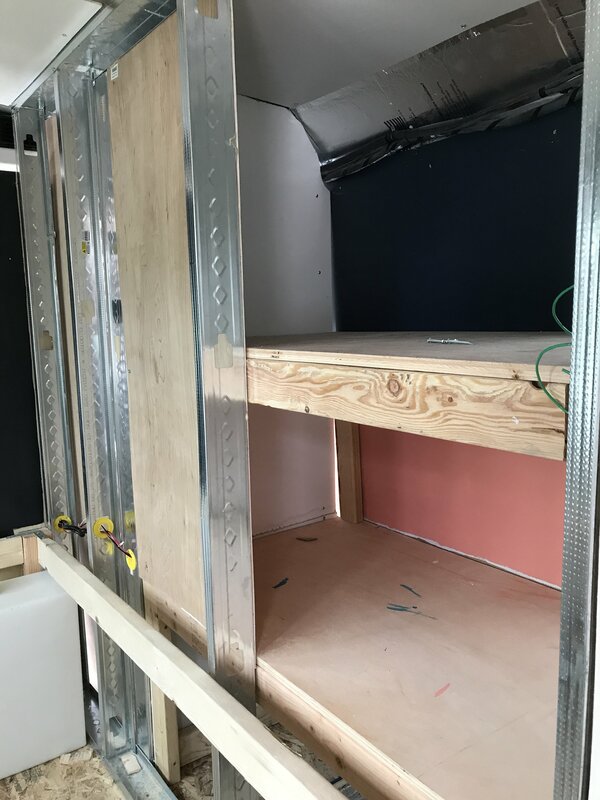 building in the bed frame. It took a couple tries, but we got it all straight! You can see the pocket door frame here. 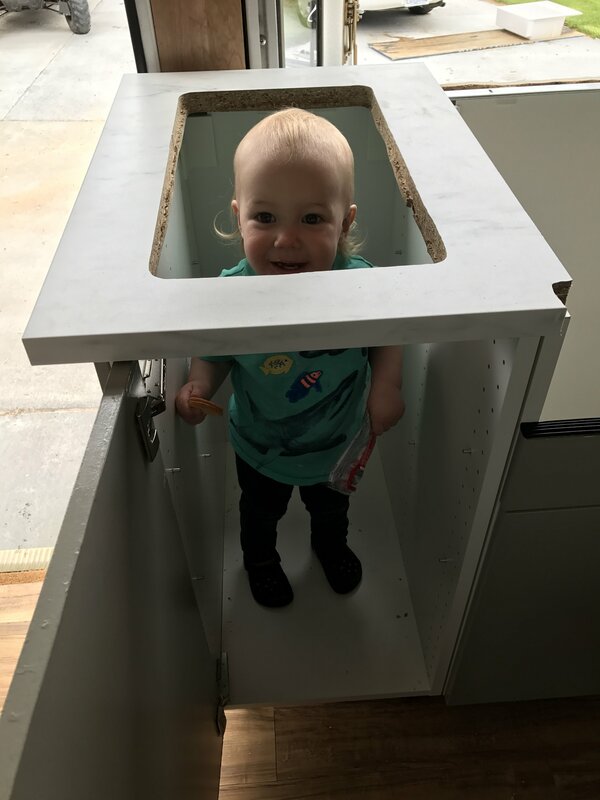 We bought one from home depot and it was pretty easy to cut and install. We opted for vinyl plank flooring instead of hardwood. 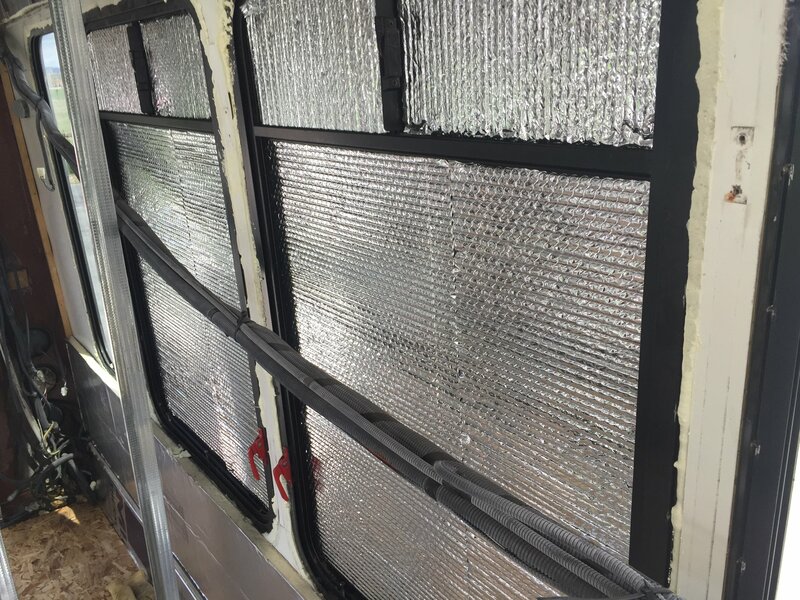 It’s light and flexible, super durable, waterproof, easy-to-replace (you can peel up a tile if it gets damaged and replace it with another), and thin—which helps when you’re dealing with limited headroom. 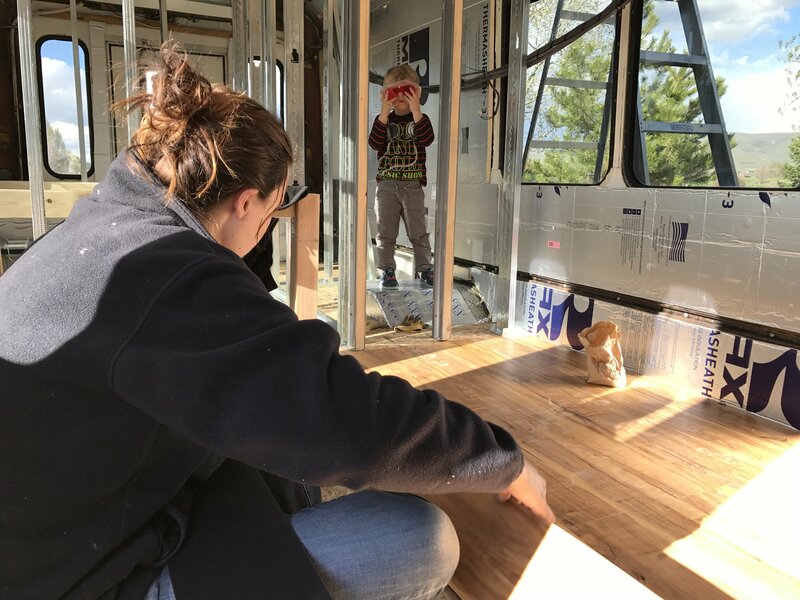 To install, we spread a thin layer of pressure-sensitive adhesive over the plywood subfloor and secured the vinyl tiles to it. 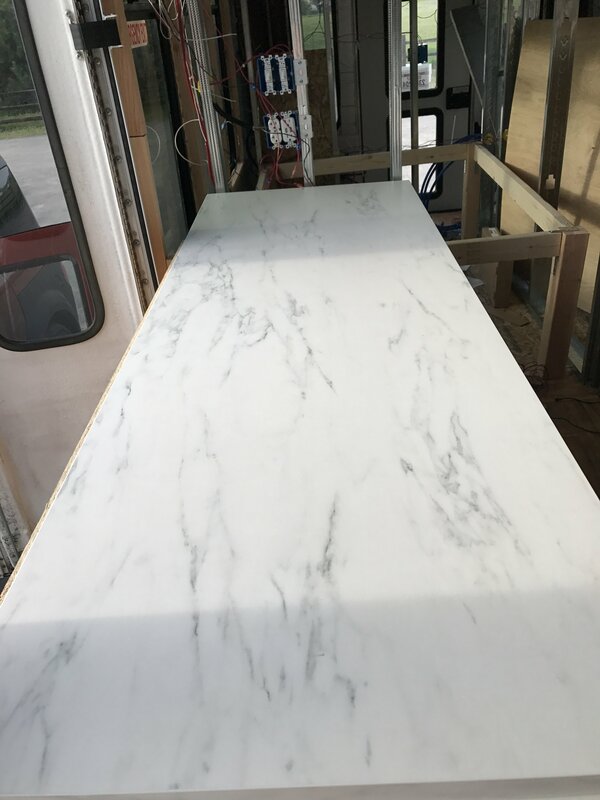 The tiles can be cut with a razor, which made trimming super easy. Once all the tiles were laid down, we technically should have gone over everything with a 100-lb. roller, but we didn’t have one of those, so David and I rolled around on it (totally ineffective, as I’m sure you could have guessed) and then laid heavy things over the seams. Not a textbook install, but it worked and everything has held together perfectly. This is where things stopped moving smoothly along. We had a huge amount of information to tackle and it took a while. 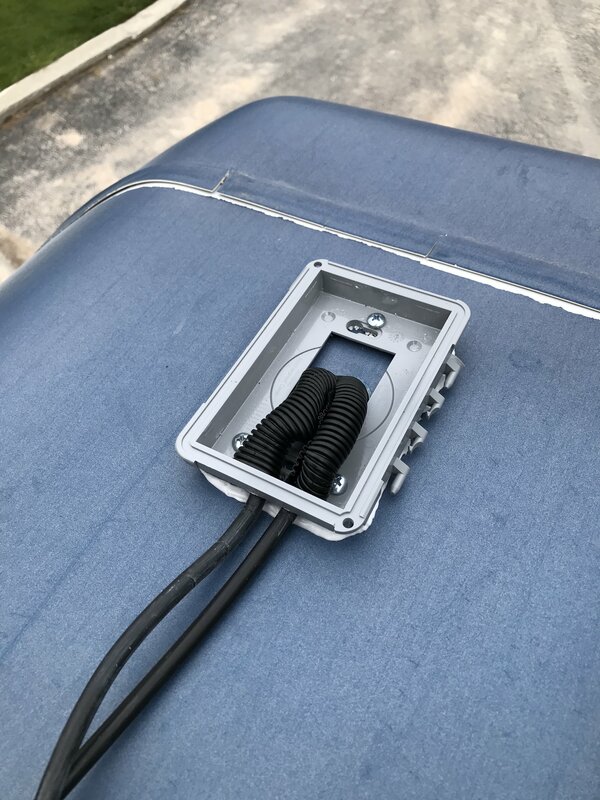 When we started, we were trying to wire into the existing electrical system so that the car’s battery could charge our battery bank and we could use a lot of the existing wiring. That became hopelessly complicated and we abandoned that route pretty quickly. 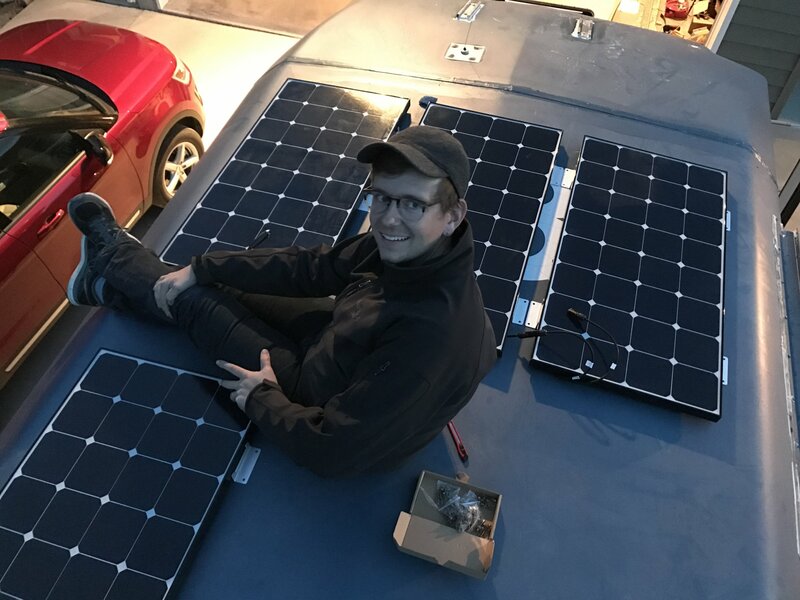 What we ended up with is a system totally separate from the car’s that runs 100% off solar. This powers three DC circuits of lights, three AC outlets, and two DC accessory outlets. We got our solar system as a kit from Renogy. It included six 100W solar panels, a 60-amp charge controller, two 200-amp hour batteries, and a 2000W AC inverter. Installing all this stuff was the easy part. 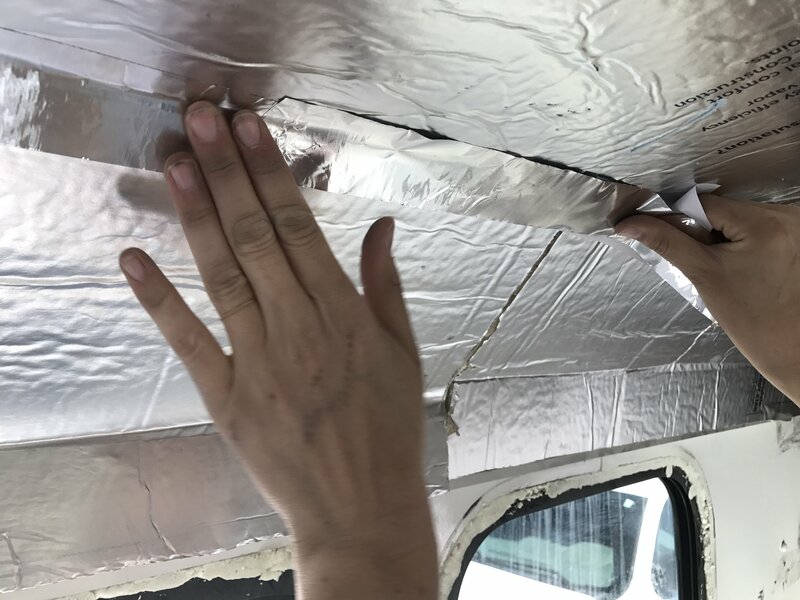 We attached the panels to the roof with the included mounting brackets and self-tapping screws, and sealed it all up with lots of silicone caulk. 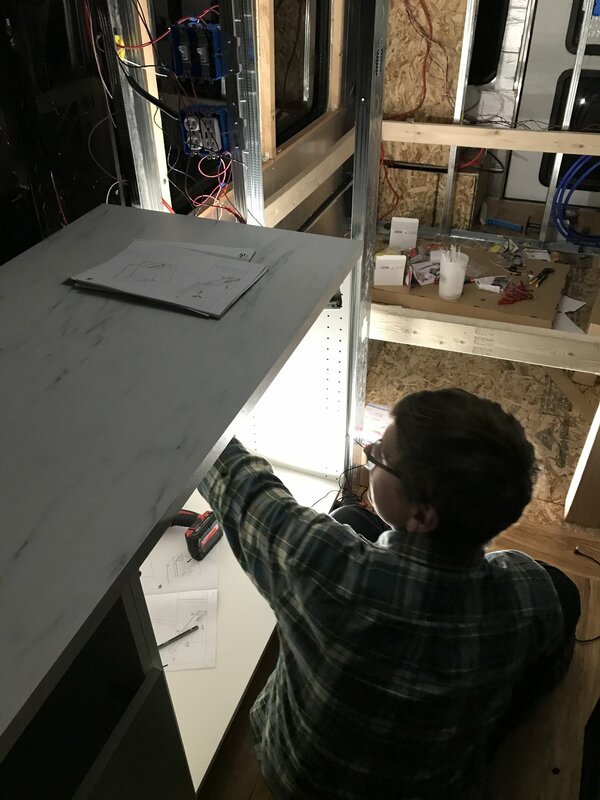 Then David wired the panels together, following a wiring diagram. The whole process was remarkably straightforward. Here is the hole for the cables to go back down to the charge controller. We covered it up with an outdoor electrical outlet cover. We love the USB charging outlets! no more lost chargers. 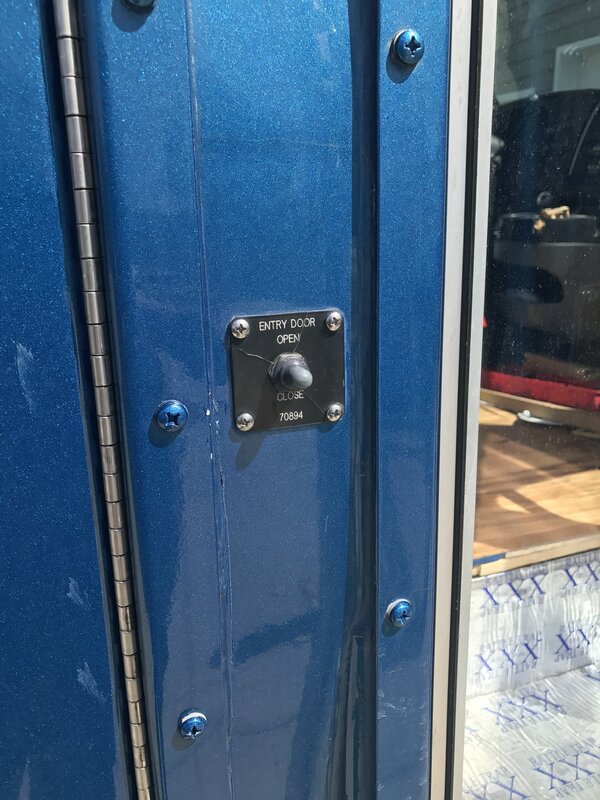 The switch to operate the morotized doors from the outside could not be turned off (seems like a design flawto me). 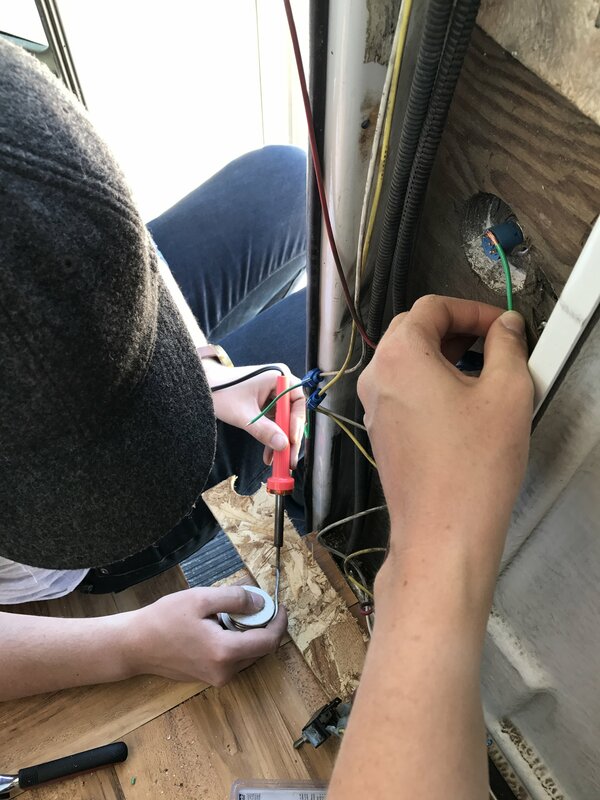 So we pulled the original switch inside and added a key switch to the outside so we could get in and out with a key. 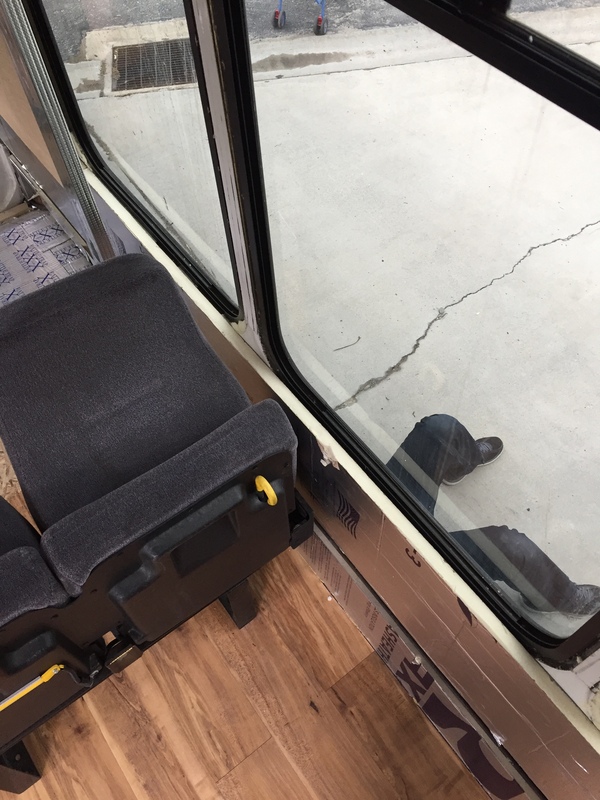 Reinstalling the seats was pretty simple but also kind of a pain because it involved drilling big holes through the floor of the bus. 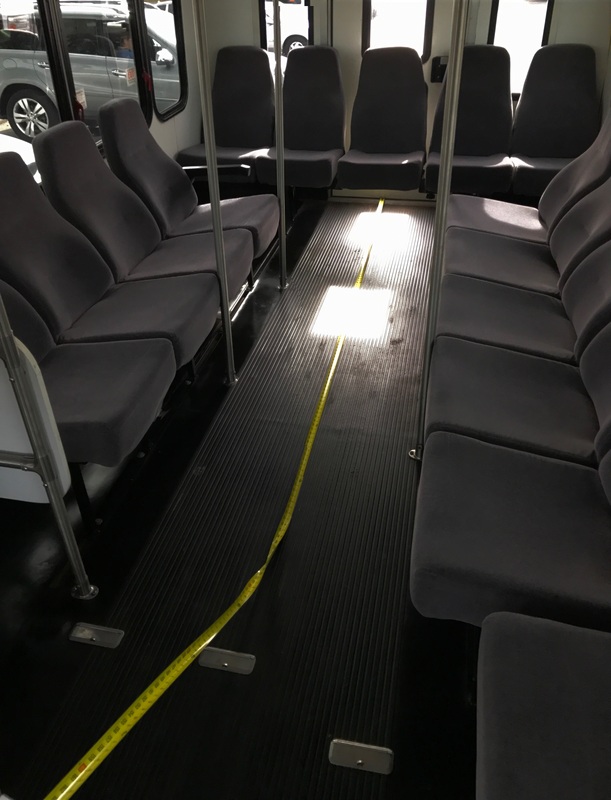 The seats were originally attached through the floor of the bus with big 1/2″ grade 5 bolts. We learned that grade 5 bolts are the ones that are usually used for automotive applications (they’re stronger than the typical grade 3 bolts you find at the hardware store). We moved the seats to their new spots, drilled a bunch of big holes and attached them with new bolts and big, thick washers (there are 6 per seat). The desert sun was not kind to all the seals on the bus exterior. 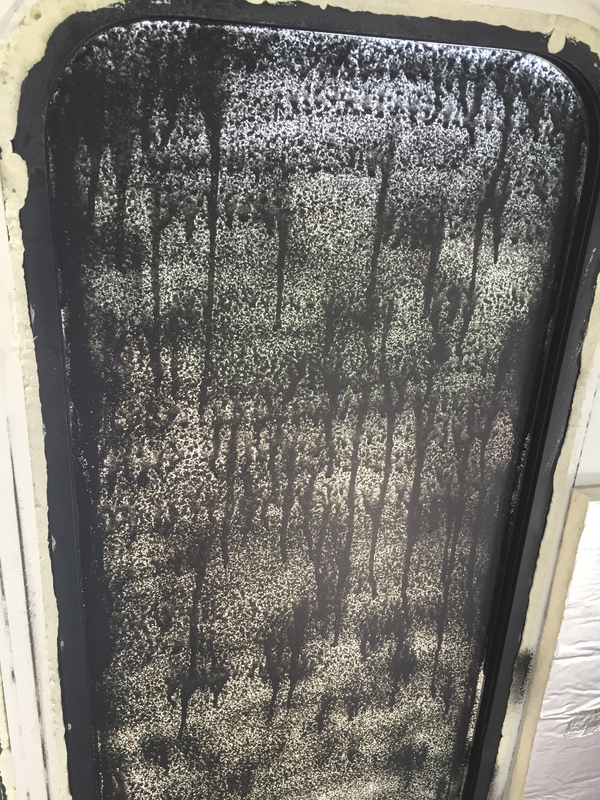 We used a razor to cut out all the damaged caulking and replace it with new exterior silicone caulk. 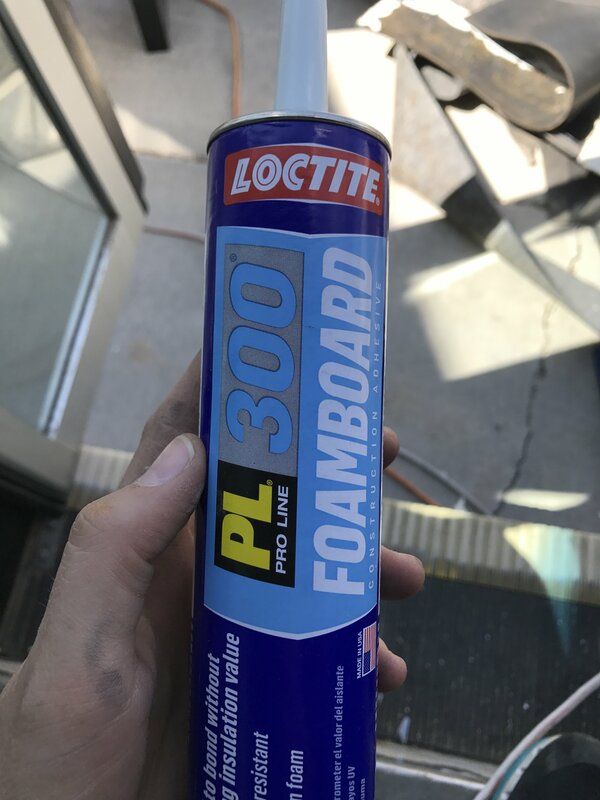 We used A LOT of this caulking. The rule was, when in doubt, caulk it! So far we haven’t had any leaks. 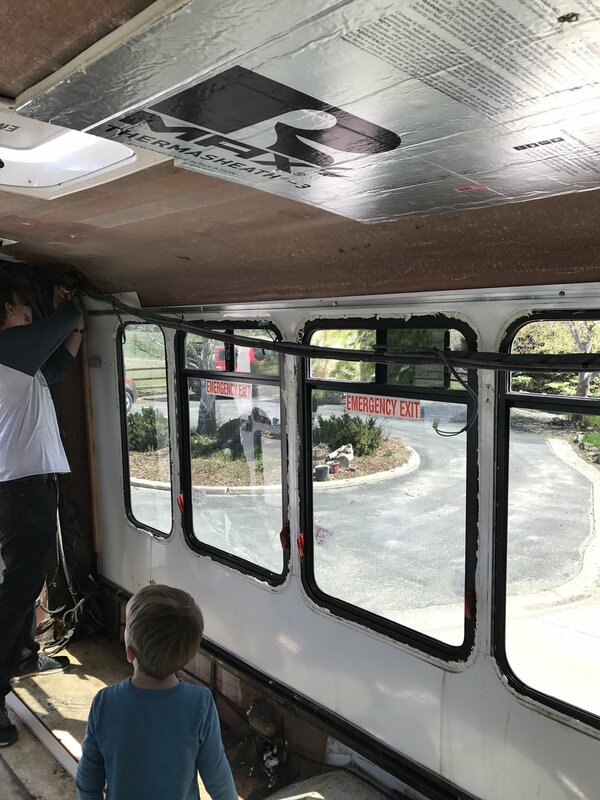 We re-sealed all the seams around the hatch and windows and the seam where the front cap attatches to the main body of the bus. IKEA was a real winner for the kitchen. 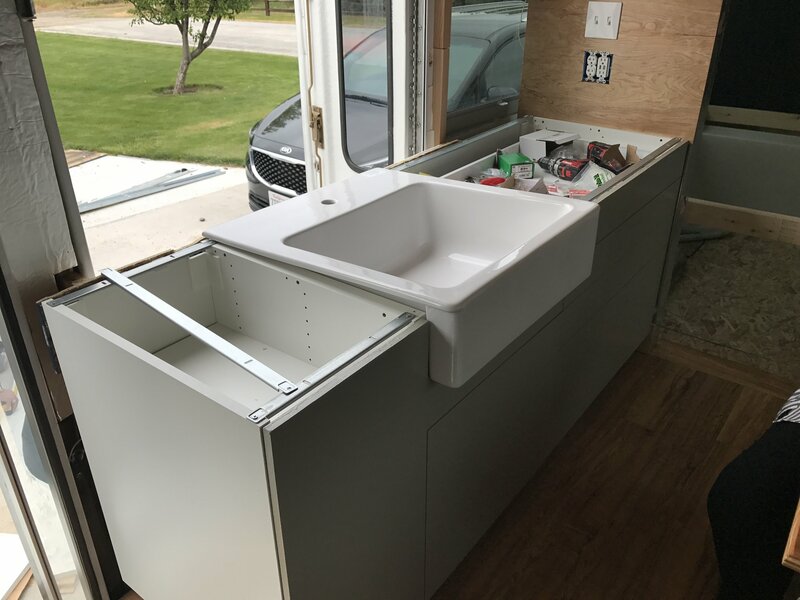 We bought all the cabinets and fixtures there and surprisingly, they are one of the most solid parts of our build. 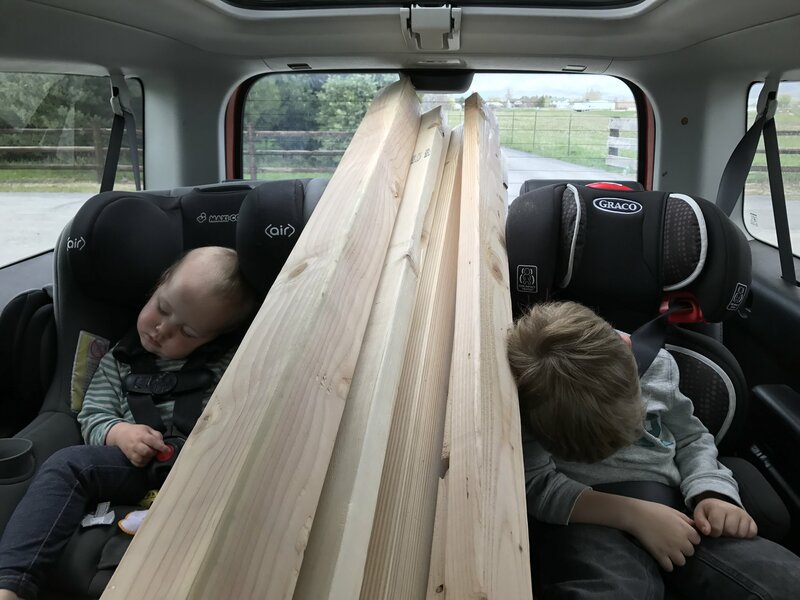 They were, in typical IKEA fashion, easy to instal. 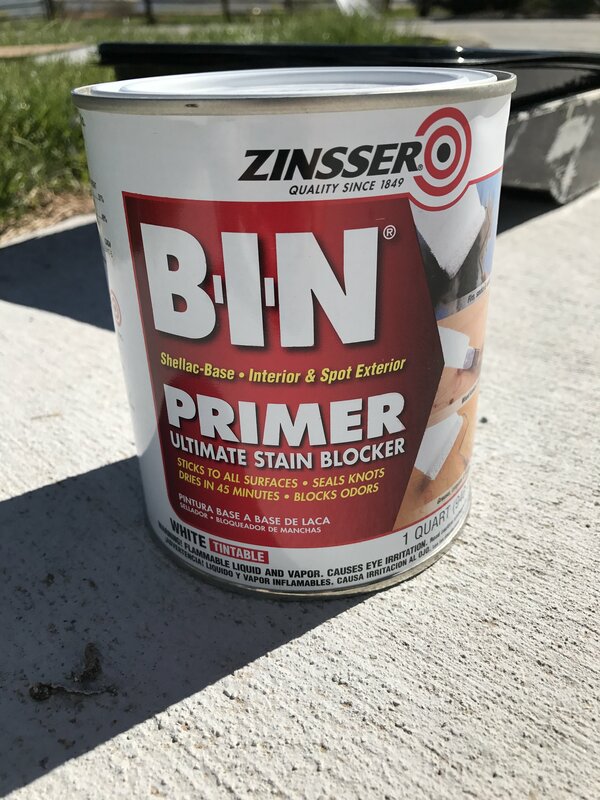 We bought the cheapest cabinet fronts and painted them after priming them with this Ultimate Stain Blocker primer. That has fared pretty well. 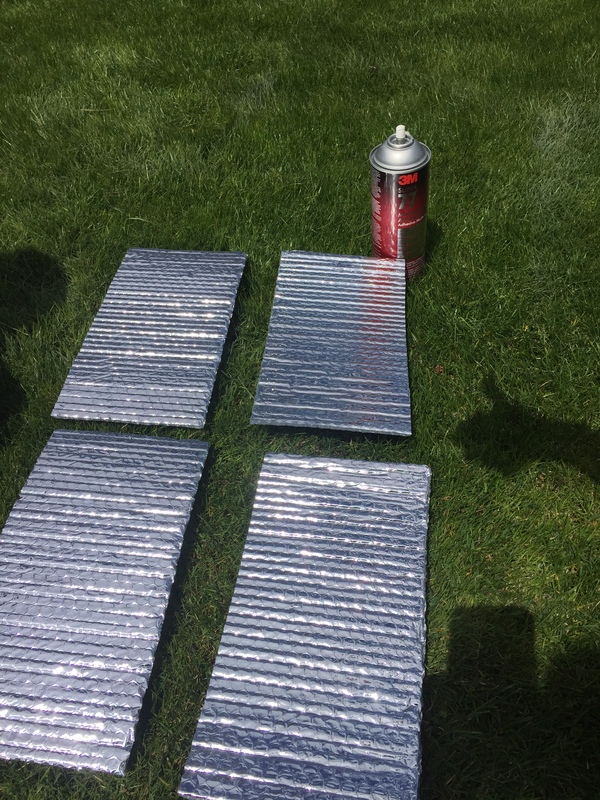 It looks good right after you do it but the finish is not the most durable so be careful, it chips pretty easy! Our stove did not come from ikea so we had to route a custom hole for it. 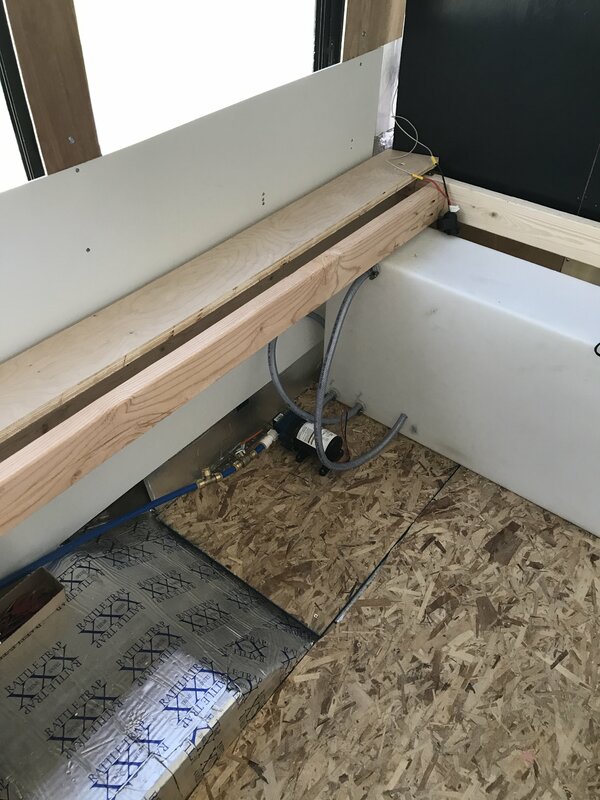 The walls and ceiling were all paneled with 1/4″ plywood. 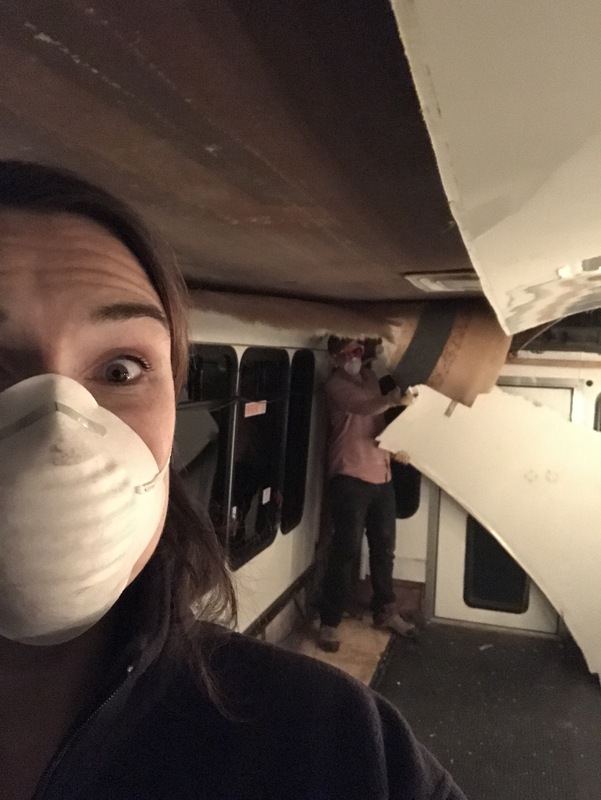 We just screwed it right into the studs or through the insulation into the ceiling of the bus. 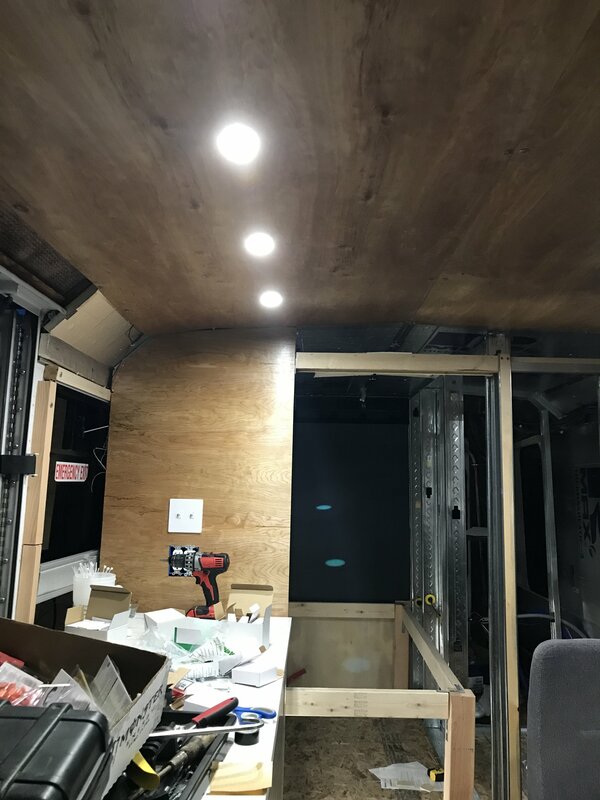 We did our wiring before attaching the paneling and cut holes for the lights. You can see the look of distress on my face. This was one of the more stressful parts of the build. Not because it was hard but becaause I was afraid of doing it wrong. In the end it ended up being pretty straightforward. 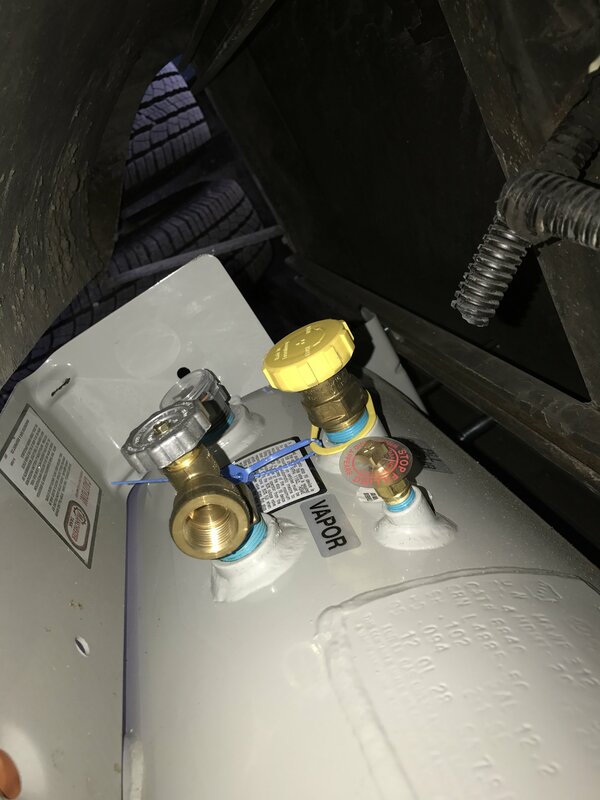 We bought a large RV-style propane tank to mount under the bus. 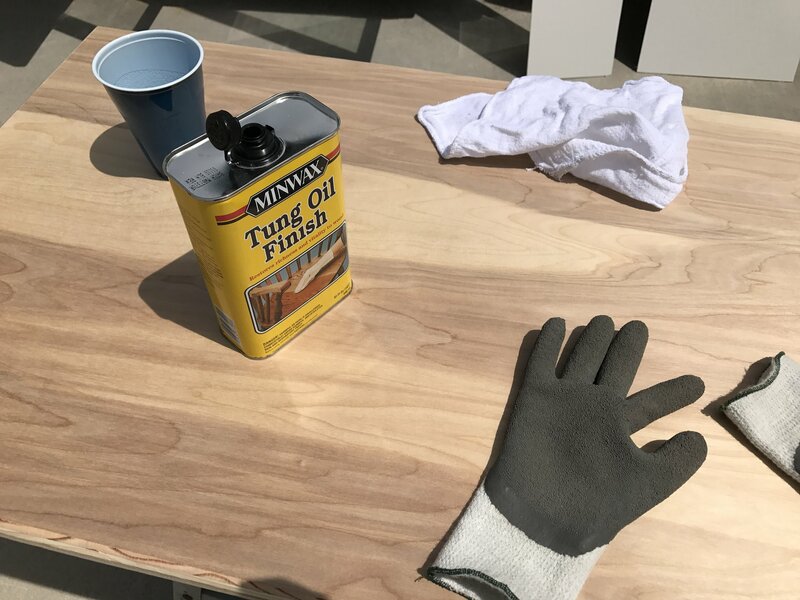 Originally I had planned to make a sealed container inside for a BBQ-style tank but enough home depot employees looked at me like I was a madman that I decided to go with the exterior mounted tank. THis also saved us a ton of cabinet space. The downside is that these tanks are significantly more expensive. It was worth every penny for the pantry space though. The beds are pretty simple. 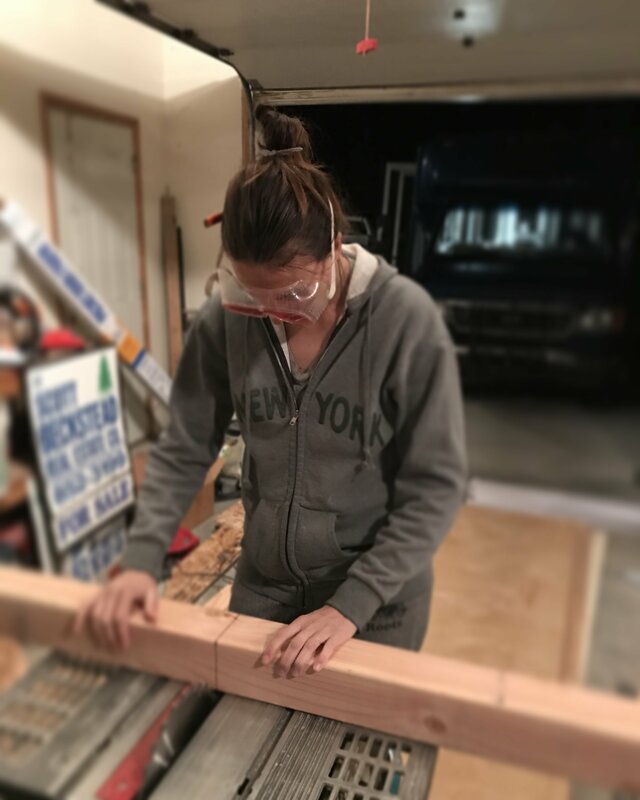 The frame is made of 2×4’s and the platform is 1/2″ plywood. They’re nice and solid and don’t squeak. We left the little sliver of window intact where it goes into the kids beds. This gives them some natural light during the day . The table is made out of 3/4″ plywood that we finished with tung oil. Super easy to do, you just wipe it on and sand a little between coats. Our plumbing should probably be it’s own article. 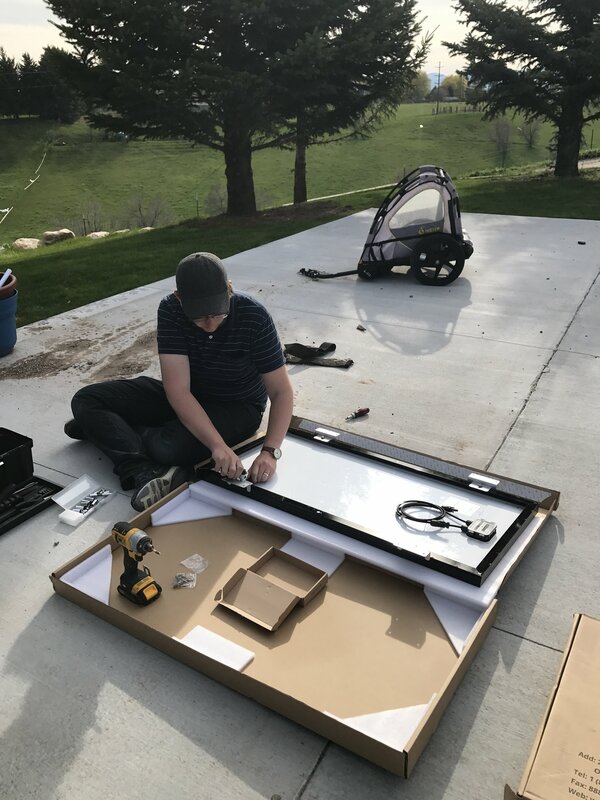 Our system is as simple as it can be but we definitely learned a lot in the process of installing and screwing it up and then reinstalling it. 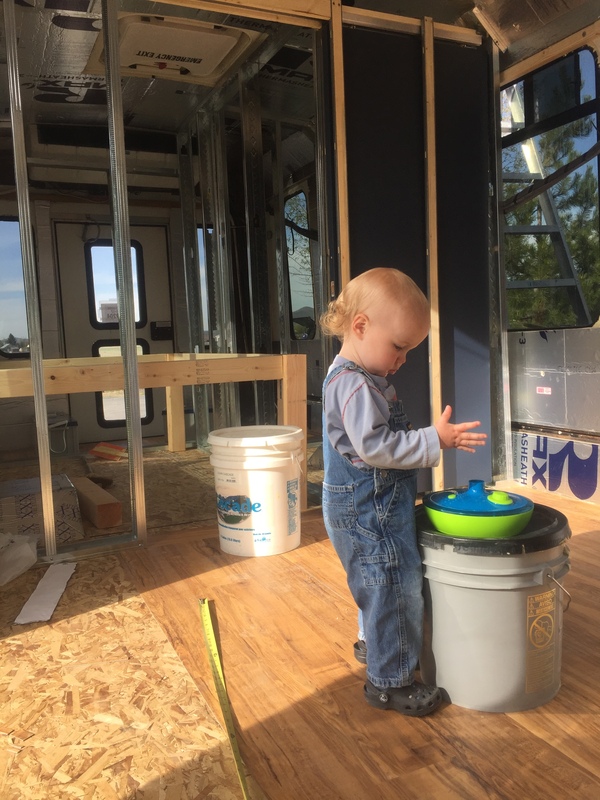 Our water tank is 39 gallons and it only supplies our kitchen sink. 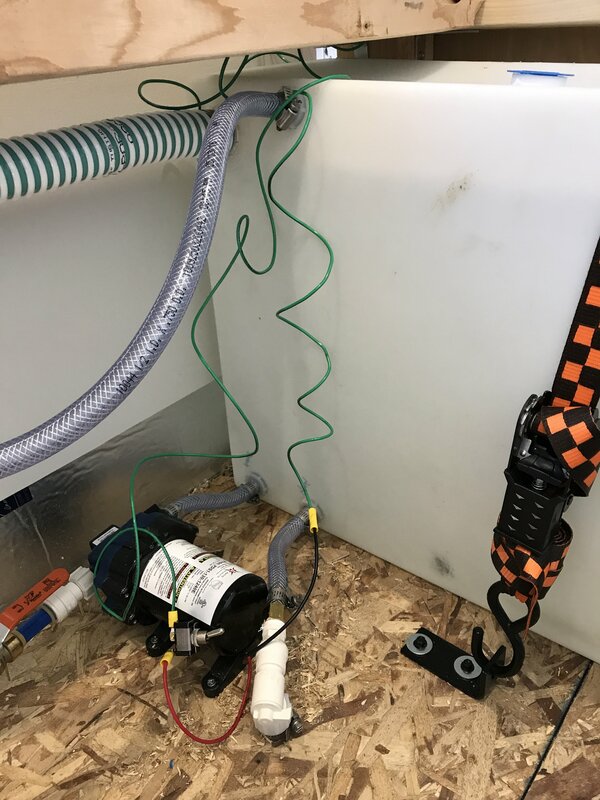 We added a hookup for city water (we’ve never used it) and another hose for either spraying things off outside our hooking up our outdoor shower. 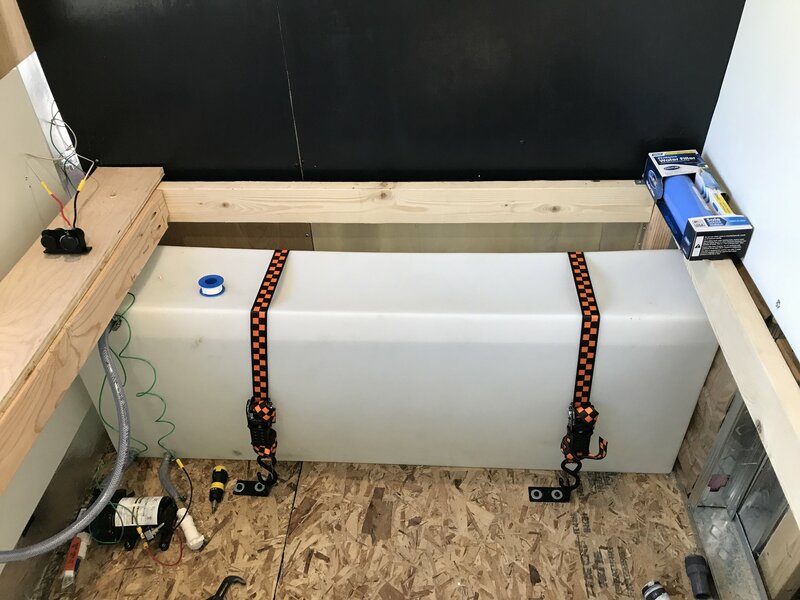 It’s all plumbed with pex and mostly shark bite quick connect fittings. We installed a switch to turn the pump off when we need to. 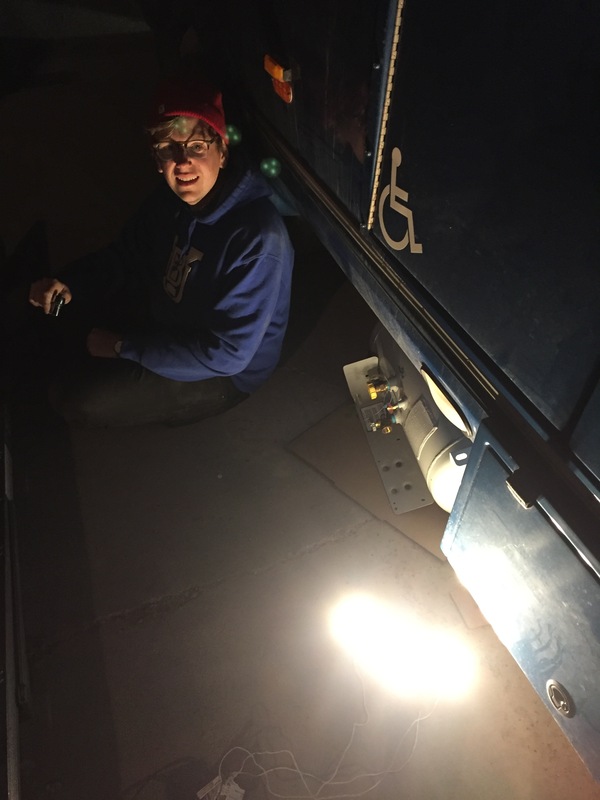 There’s also a drain that does out the floor of the bus for draining the tank. We attached the tank with tie down straps rated for double it’s full weight. We also ended up adding some plywood supports to either side of the tank to keep it from bulging out when it’s full. Stay tuned for more detailed videos explaining our build! I LOVE posts like these. I always feel bad when my friends do all of the electrical stuff before we meet- it’s so much information to absorb and make work together and sometimes the internet is just too full of information to really wrap your brain around. You did awesome, though! Your blog is consistently interesting to me. It is remarkably well written and photographed. Your talents combine just right for outstanding posts, park after park. Seems you are capable of success in whatever you try – from construction of your rolling home to retrieving a drone from a tree on a cliff edge. Your eyes for photos and ears for words and tenderness toward the children all makes for a splendid mix. 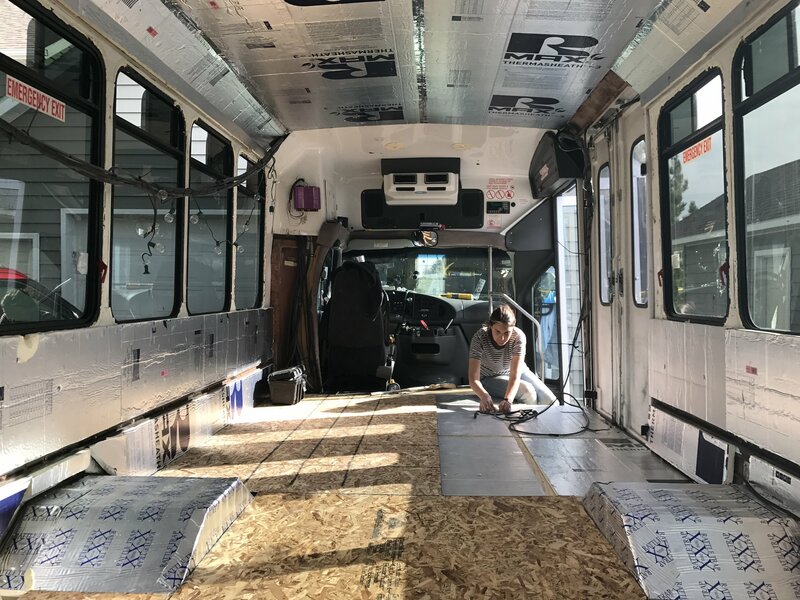 The build of the bus-home is an example of your capabilities. You made a complex many-faceted job look even easy. I really enjoy reading along. Thanks to both of you and to those two wonderful children who add so much. I think of your blog as an illustrated WALDEN POND on wheels. I absolutely LOVE the build. Very impressive design/layout. Well thought out. 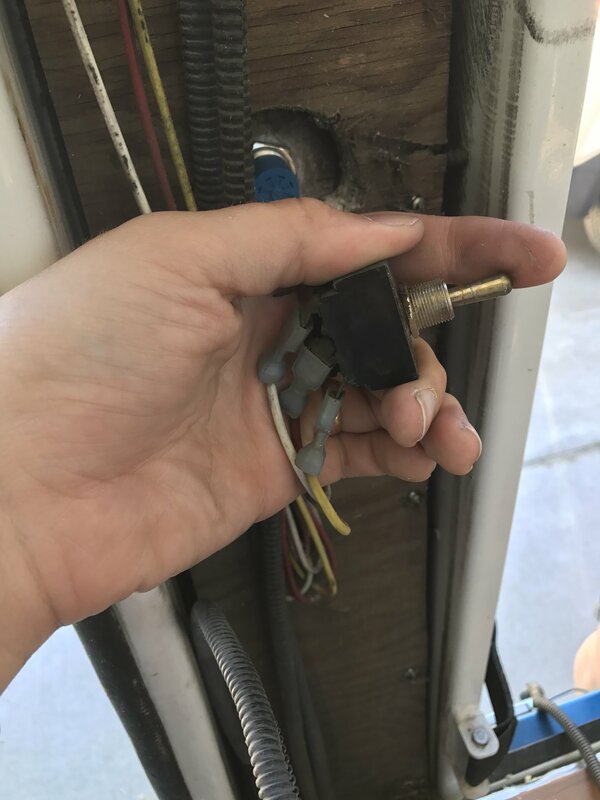 I’m curious about what you do for heat and A/C when the engine isn’t running? When I was a kid we had a propane heater in our VW bus camper that would keep it warm on cold nights. Do you have heat other then engine heat? Or, do you just travel to reasonable climates during the seasons and/or use a lot of blankets? I want to do a build very similar to yours but will want stand-alone (engine off) heat, possibly A/C. Hey! So we have a little propane heater for when it gets way too frosty, but for the most part we try really hard to stay where the weather is reasonable. When we’re all sleeping in our little bedroom area, we stay toasty—we only use the propane heater when we’re awake because the little propane canisters only last about 2 hours. 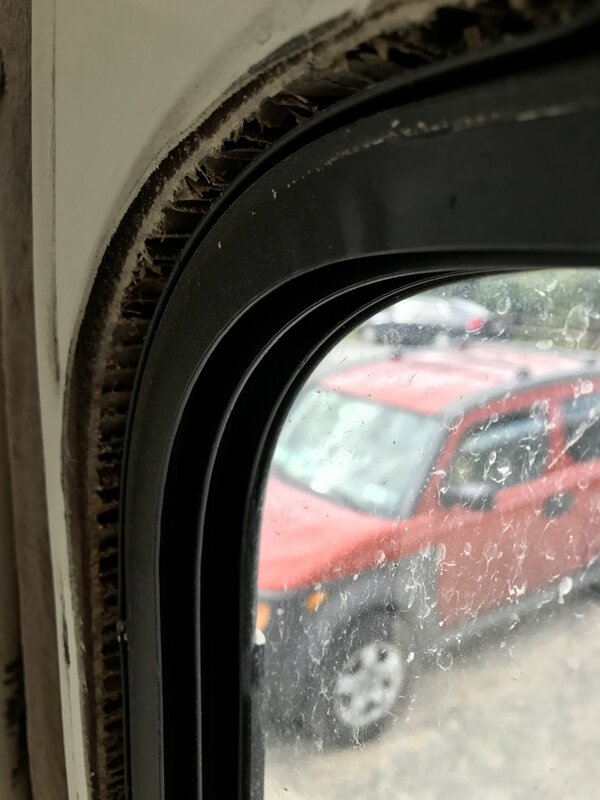 The A/C has really been the only thing we don’t like about the bus—we don’t have one and it gets incredibly stuffy in there when we’re in hot weather! We recently discovered that our alternator is big enough to charge a huge set of house batteries, probably enough to run an A/C on, if Buster’s next owner wanted to do that! Is there a reason you didn’t include price? We are hving a hard time coming up with a budget since there is such a variety in the types of conversions. You guys are the closest to what we are looking for and would love to know your prices if you don’t mind sharing! Thanks. Hey! 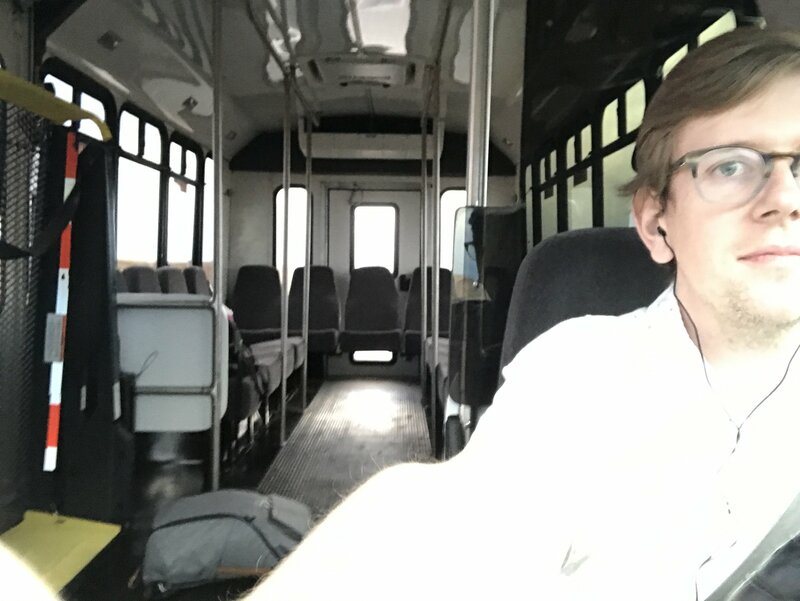 Not sure what exactly you’re looking for on price, but we spent about $10k on the bus itself and put around $20k into it. Hope that helps! Mainly because we’re running David’s desktop computer in the back office! Otherwise it’s just the regular stuff: charging devices, fridge, fan, etc. What kind of gas mileage do you get? Thank you! It’s not great, that’s for sure! Around 8-10, depending on conditions.